I am attempting to transition from LoveYourBigMuddy.com to my new site. 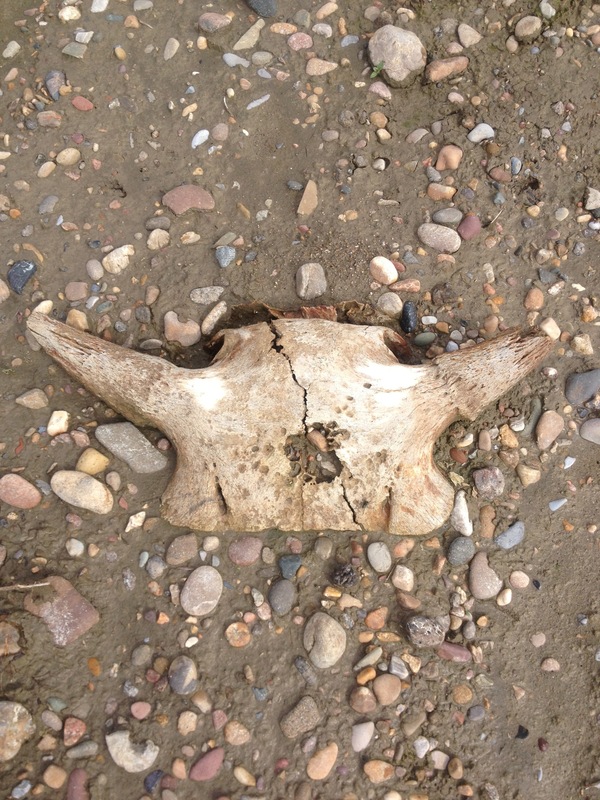 Please visit and follow my new blogsite for the 1Woman3GreatRivers Project. 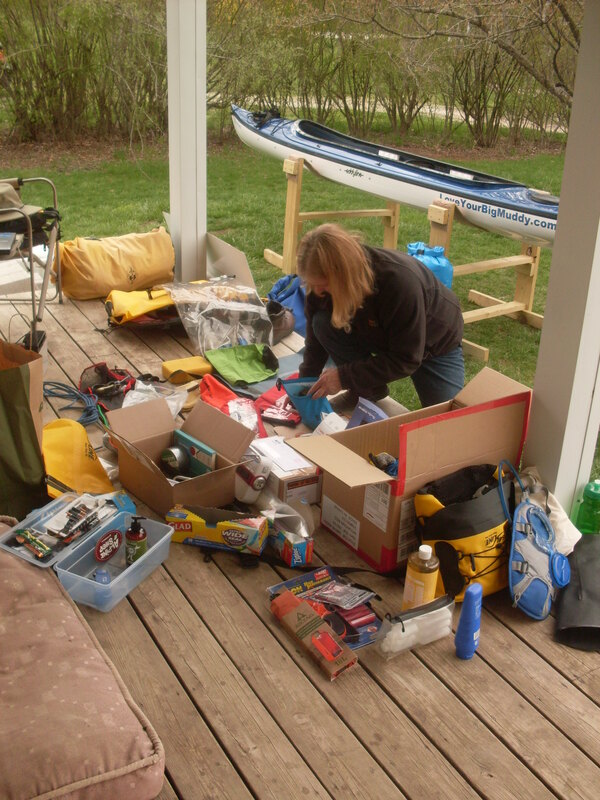 I will be launching at the Mississippi River’s source, Lake Itasca, MN, on or about May 25. 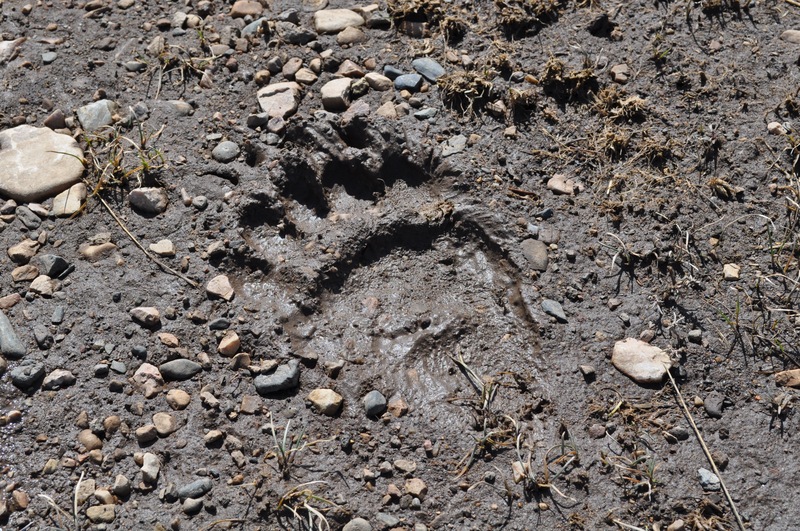 And, well, you know the routine…I will try and post more blog entries this trip along with my Facebook posts. Please follow along! I don’t want to lose you. 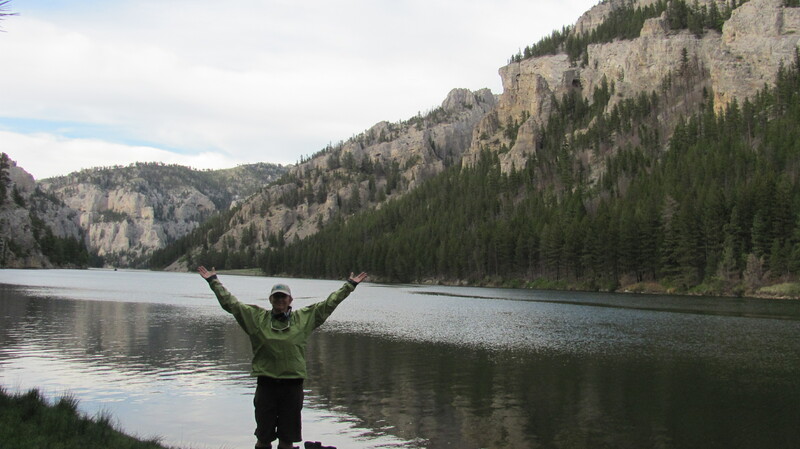 I have created a new blog site, 1Woman3Great Rivers Project @ 1woman3greatrivers.com, for my next adventure package. 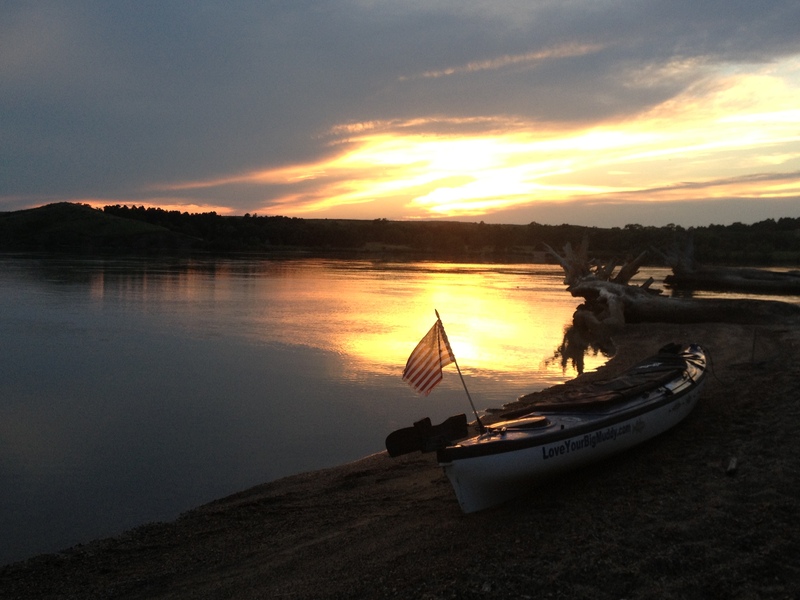 This new project will have me paddling from source to sea the three longest rivers on the continent: The Missouri River (done), The Mississippi River (2016), and The Yukon River (2017). 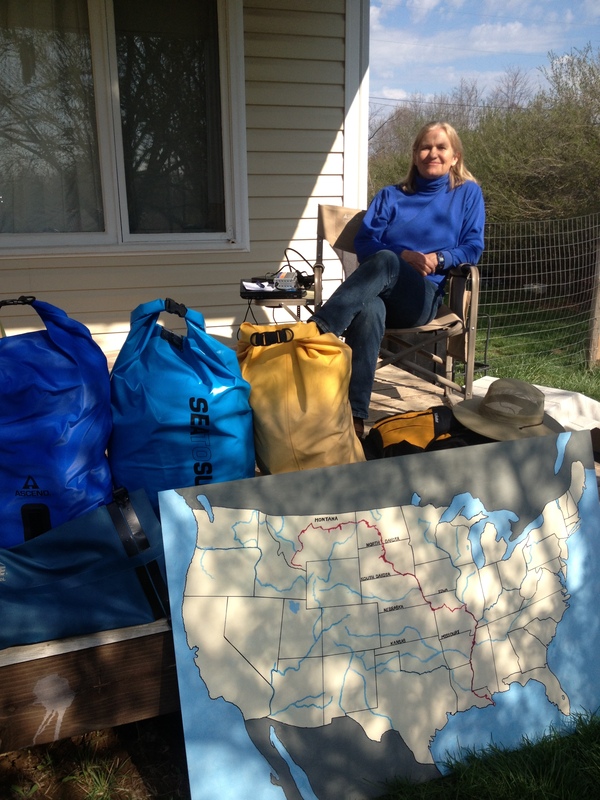 I am very excited about paddling these rivers and rigorous planning will begin soon. Actually, I’ve been working on it for several months. 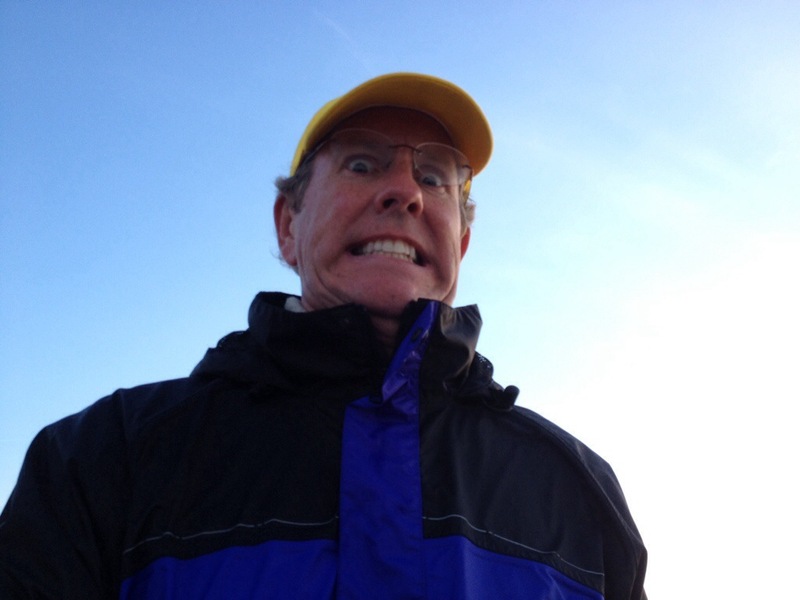 I do not want to lose you as followers, so please consider following my new blog site. I will try to arrange my new posts to copy over here, but I am still learning much about navigating between these two websites. Here is a copy of my first and only post on my new site. Stay tuned for more to come. 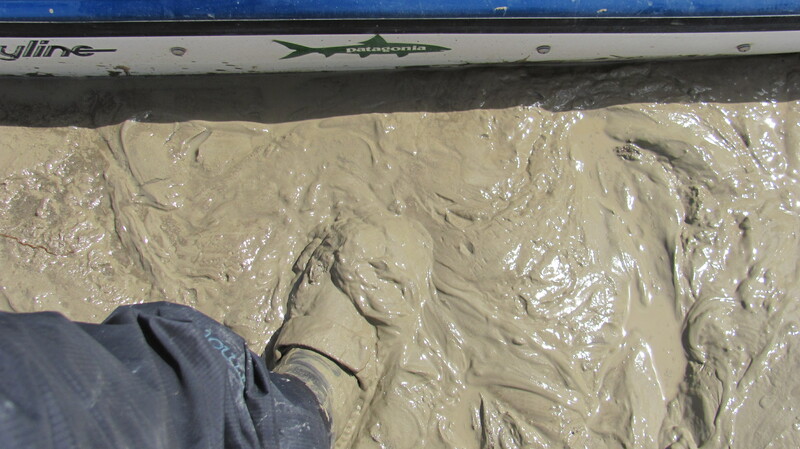 They don’t call it the “Big Muddy” for nothing, that’s for sure. Haha! 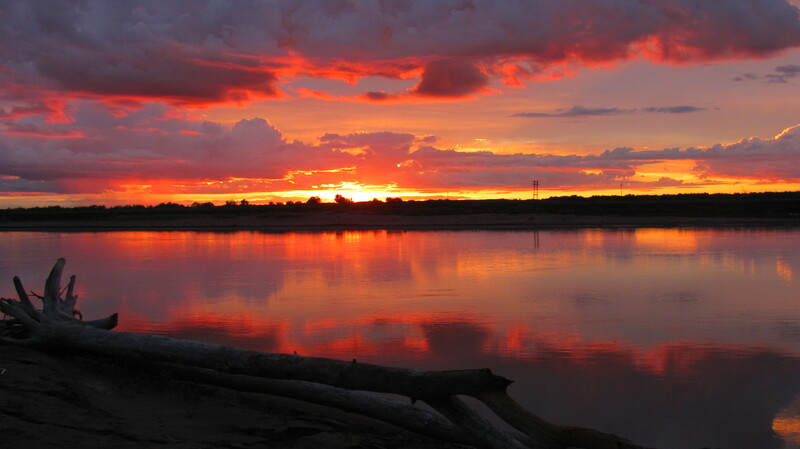 The Great Missouri River is referred to as the Big Muddy. 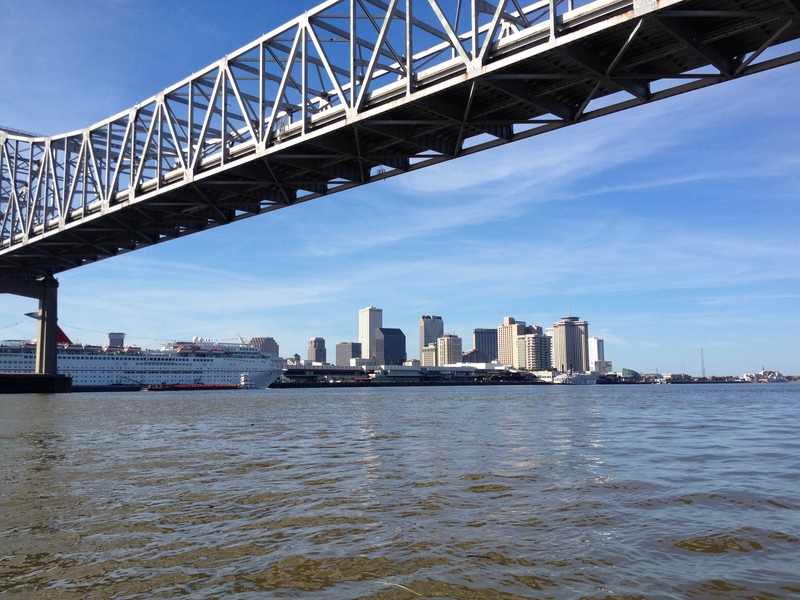 But, hey, so is the Great Mississippi River. 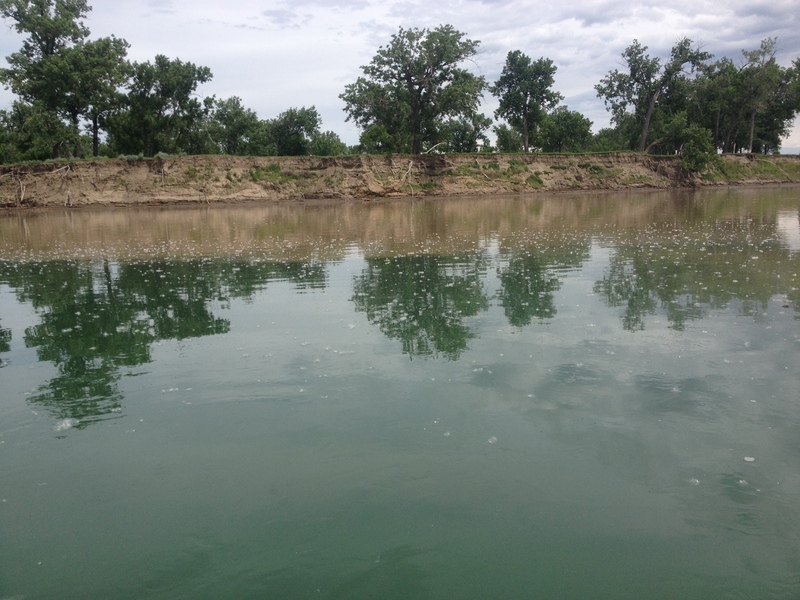 As numerous paddlers of both rivers know quite well, these two rivers can be, indeed, quite muddy. 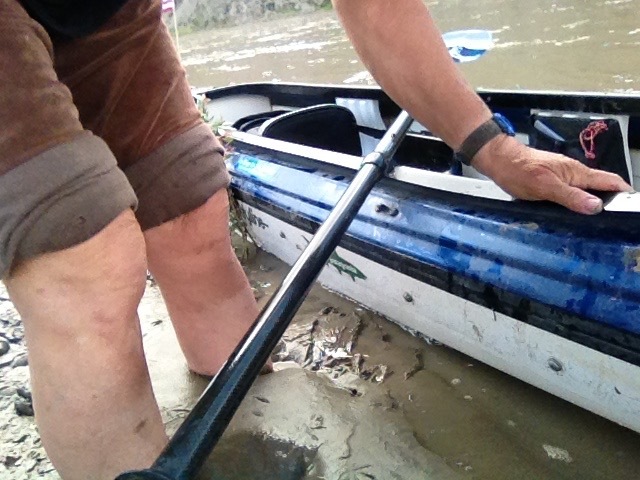 While paddling down the Missouri River on my LoveYourBigMuddy Expedition in 2013, I have to admit the mud was abundant on the upper stretches, but silky soft and rather clean. I know, right?! “That’s impossible,” you say. I actually found that going barefoot in this mire of mud was the best way to go. Once in the boat my feet washed off easily, and off I went. That’s not to say that I wasn’t glad when the earth hardened up. 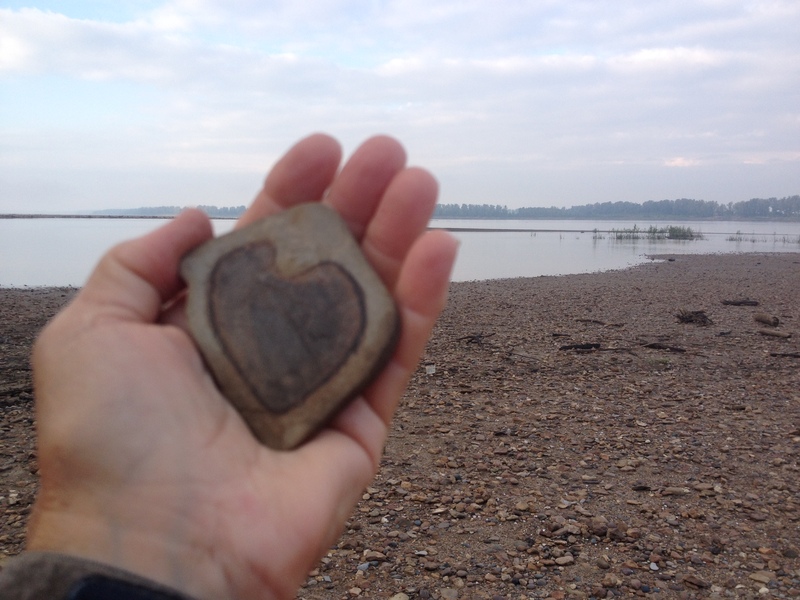 Joy filled my soul with the simple pleasure of dirt, rocks and sand replacing the squishy brown muck. 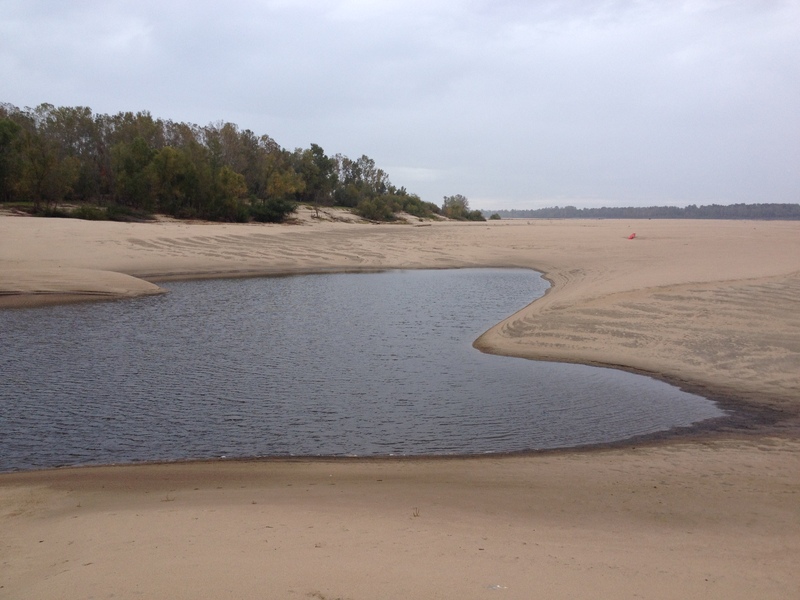 Ahhh, yes, the glorious sandy beaches of the lower Mississippi. Well, in 2013 they were glorious. 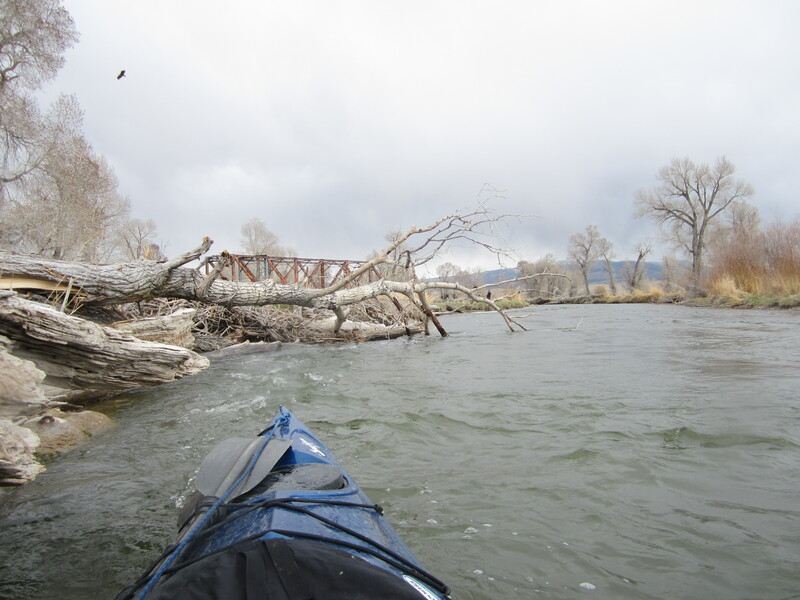 2015 was quite a different story with the river running flood stage all summer, and paddlers scrambling for dry land on which to sleep. A Mississippi Blue Hole is great for a refreshing swim and/or careful bath. 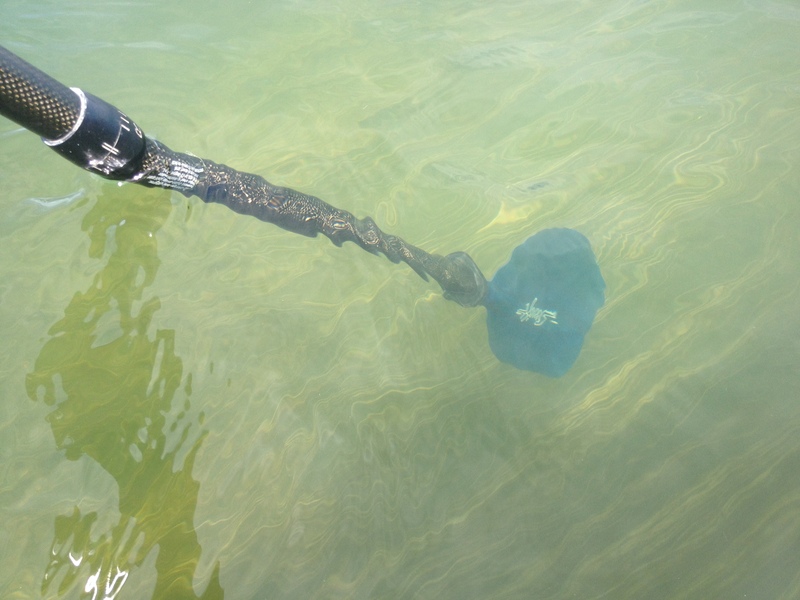 Blue Holes are created when the main river drops below the level of the sand bar, losing its connection with the pool. What a sand bar!! 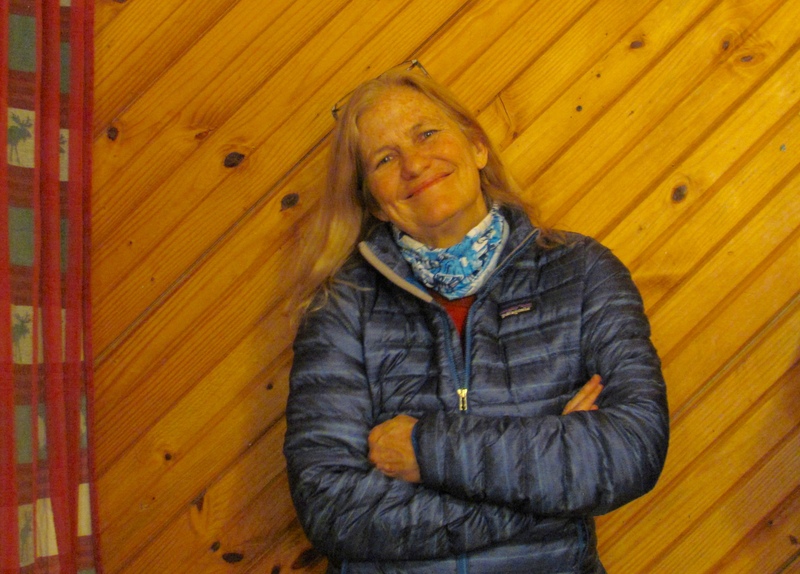 I will be heading north to Lake Itasca, MN, the source of the Mississippi “Big Muddy” River, this May to begin a source-to-sea paddle of this other great river as part of my 1Woman3GreatRivers Project. 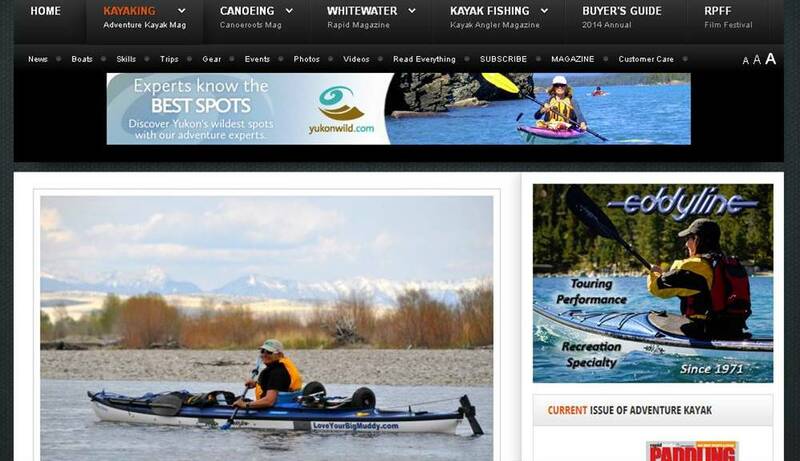 My goal is to solo paddle the three longest rivers in North America. 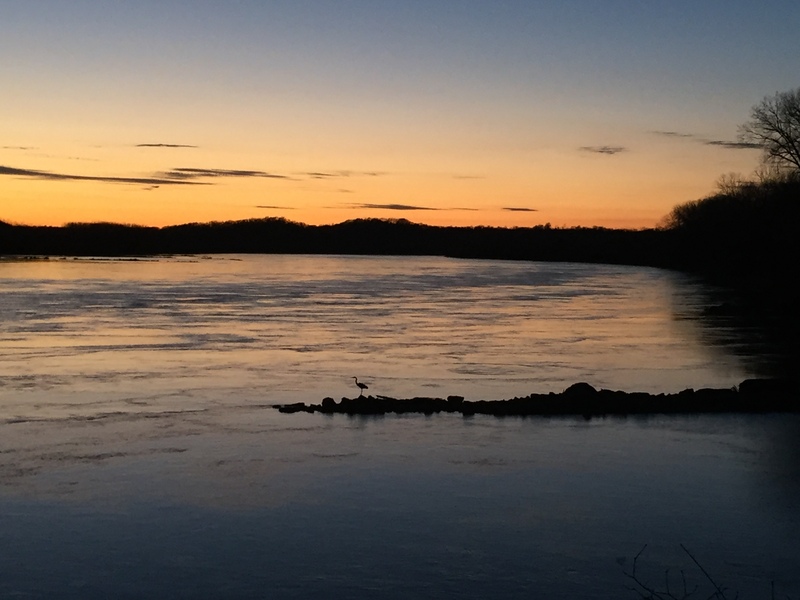 The Missouri River is the longest river on the continent at 2,540 miles, according to the United States Geological Survey (USGS), with the Mississippi coming in a close second at 2,320 miles (per Environmental Protection Agency-EPA). 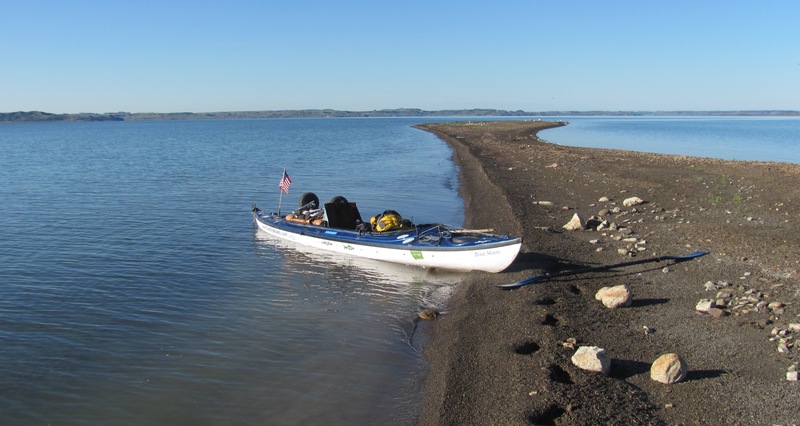 The third longest river is the Yukon River at 1,980 miles (per USGS), which I will attempt to paddle in 2017 from its source at Atlin Lake’s Llewellyn Glacier, to the Bering Sea. 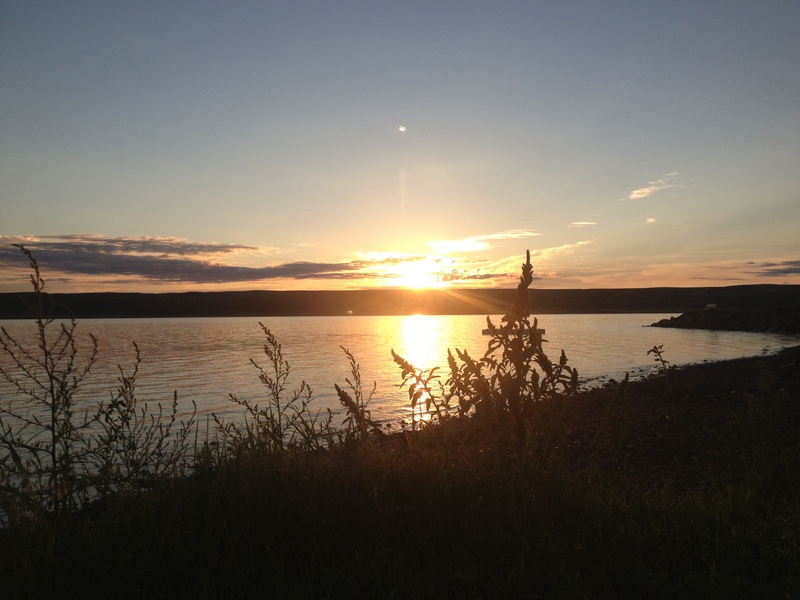 Yukon River means “Great River” in the Gwich’in language. “The Gwich’in are the northernmost Indian Nation living in fifteen small villages scattered across a vast area extending from northeast Alaska in the U.S. to the northern Yukon and Northwest Territories in Canada .” (http://ourarcticrefuge.org/about-the-gwichin/) More about the Gwich’in Nation, the Arctic National Wildlife Refuge, and my 2017 Yukon Pursuit later. I say, “Bring it on”!!! I hope you will join me on this journey down our continent’s Great River to the Gulf. Know your river. Touch your river. Love your river. One never returns from an expedition the same. Your life changes, your perspective changes, your needs change, your desires change. 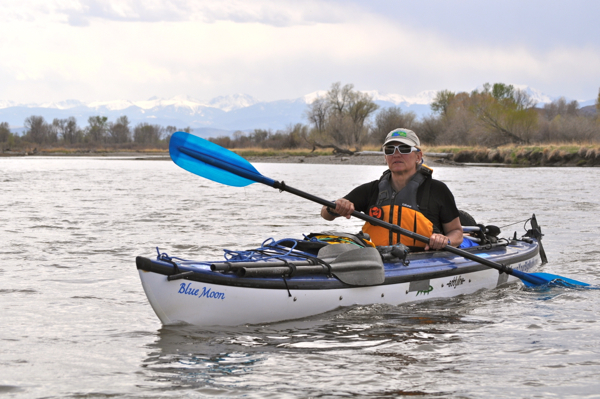 The independence accrued from a solo paddle expedition will lead you to new heights and challenges. Life is too short for status quo. The vision, mission, and decision for something new and meaningful is ever present. And, recognizing the moment when the time is right to embark on a new adventure occupies one’s thoughts continuously. Of course I speak for myself, but maybe others, too. 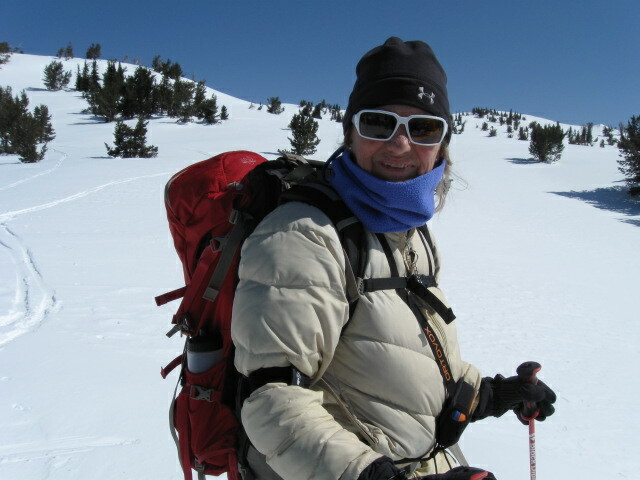 “So, Janet, what’s your next adventure?” A popular question about which I have been asked many times. For awhile there I began to believe I could go on another expedition. I began researching the Amazon River and contacted my friends on Facebook who have paddled it already, namely Mark Kalch and West Hanson. Man oh man, what an awesome adventure THAT would be! 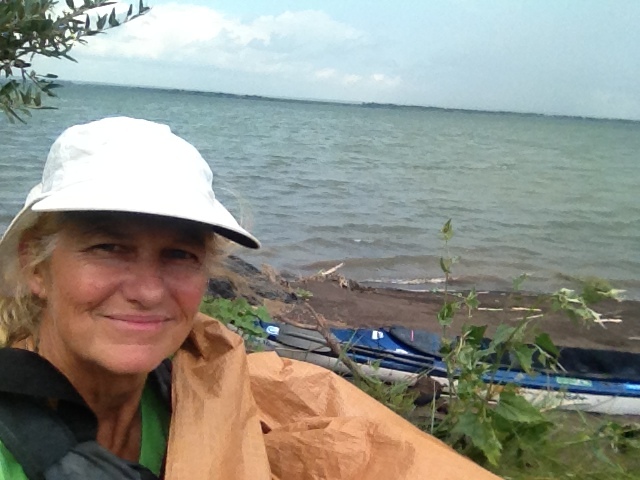 Not only do I have an interest in South America, but to paddle the second longest river in the world??? Solo?! We are talking real-deal adventure! Too bad about the Class V+ white water on that 500-mile section…hmmm, do I REALLY want to risk my life? How could I ever pay for such a thing? How long will it take? How DO those adventurers DO it??? Back to reality. 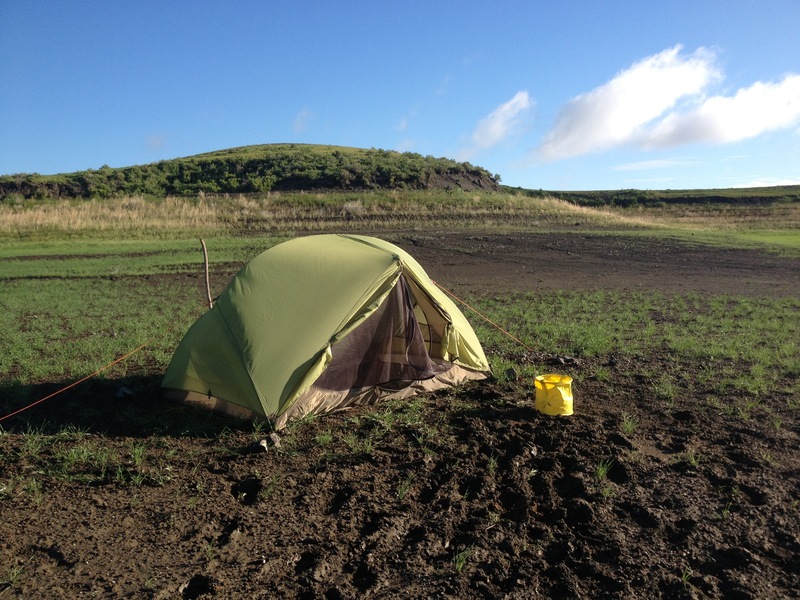 Spending 7.5 months on an expedition is costly. I am so thankful for my supporters along the way who carried me through financially, but the money hole that awaited me post-expedition was, or is, enormous. I left on my expedition with pocket change, and came home with the same. Upriver from the town of Lower Brule, this boat ramp was not on my map but a welcome sight since I did not have time to make it to Lower Brule this day. This boat ramp was so beautiful and a pleasant place to camp. 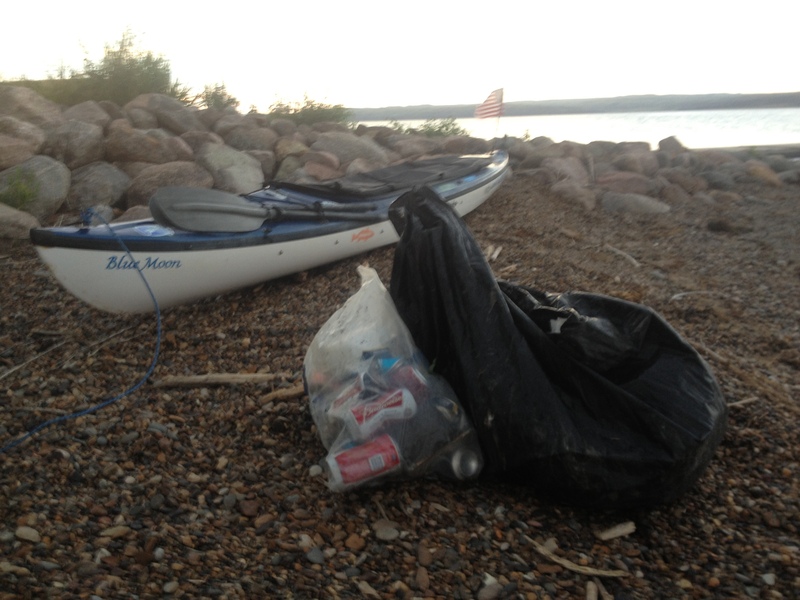 Not a whole lot to do once I set up camp at the Little Bend Boat Ramp, so I picked up trash. 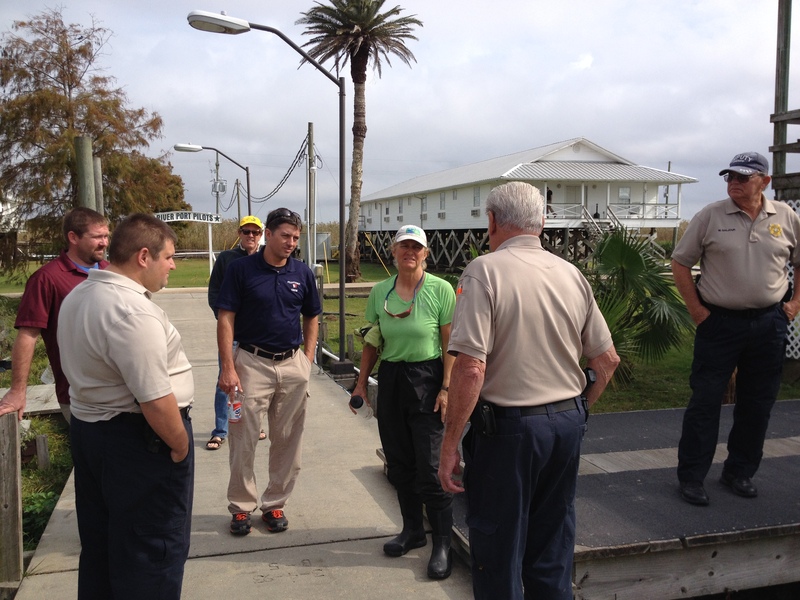 Busy boat ramp popular with the fishermen and families. Everyone was very friendly, that night and the next morning. The fishermen were there at the crack of dawn, as I recall. 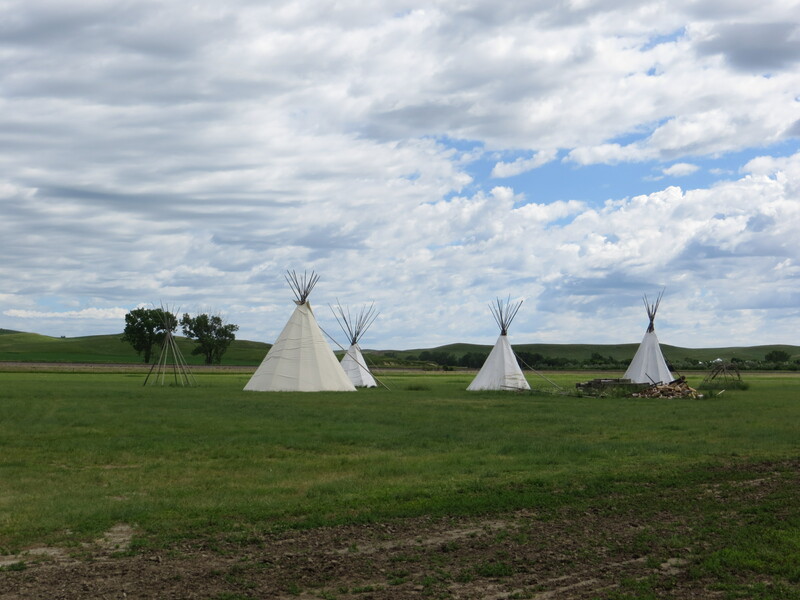 I visited Lower Brule Sioux reservation while on expedition. 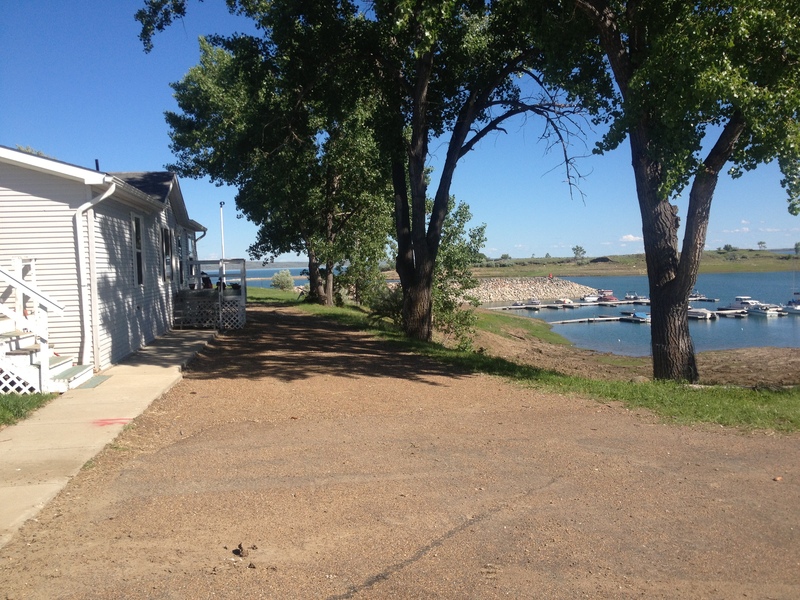 I landed in Chamberlain, South Dakota, on Thursday, August 9, 2013, which is downstream a few hours, below Big Bend Dam. 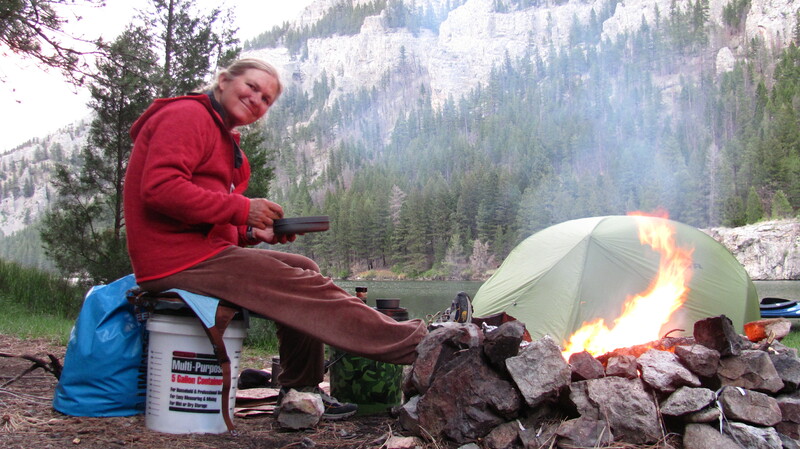 My campsite was at the beautiful American Creek Campground located on the waterfront shore of Lake Francis Case. Jessica Giard was my river contact in Chamberlain, at that time the editor of the local town paper. 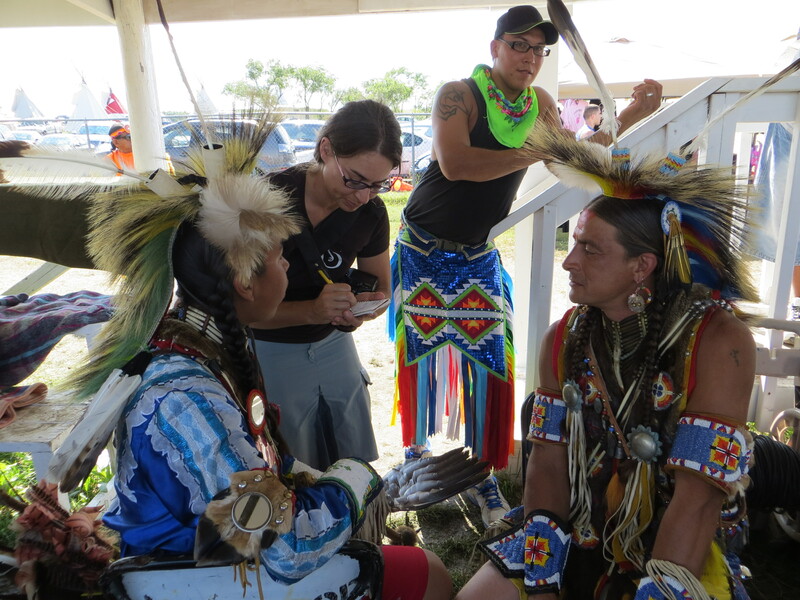 We enjoyed each other’s company very much and made arrangements to drive to the Powwow at Lower Brule on Sunday, August 11, 2013. 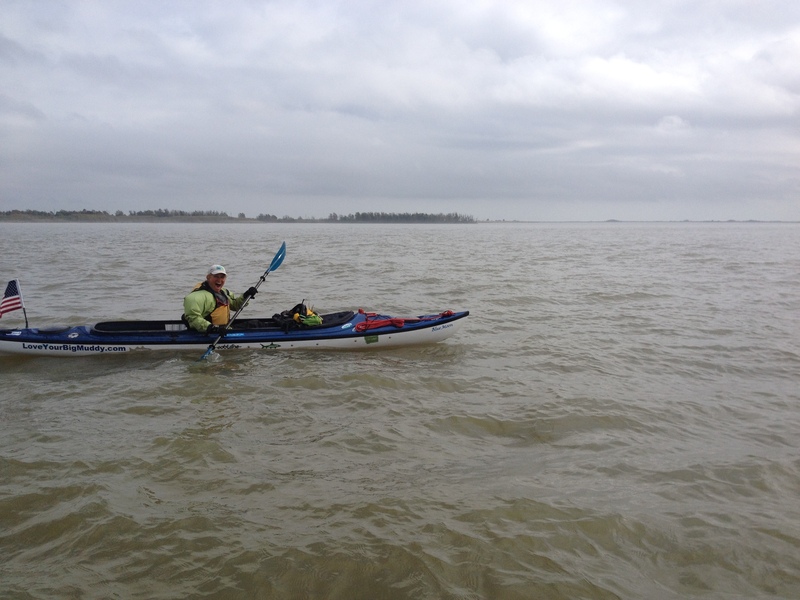 A photo of me during expedition taken by fellow long-distance paddler David Forbes. 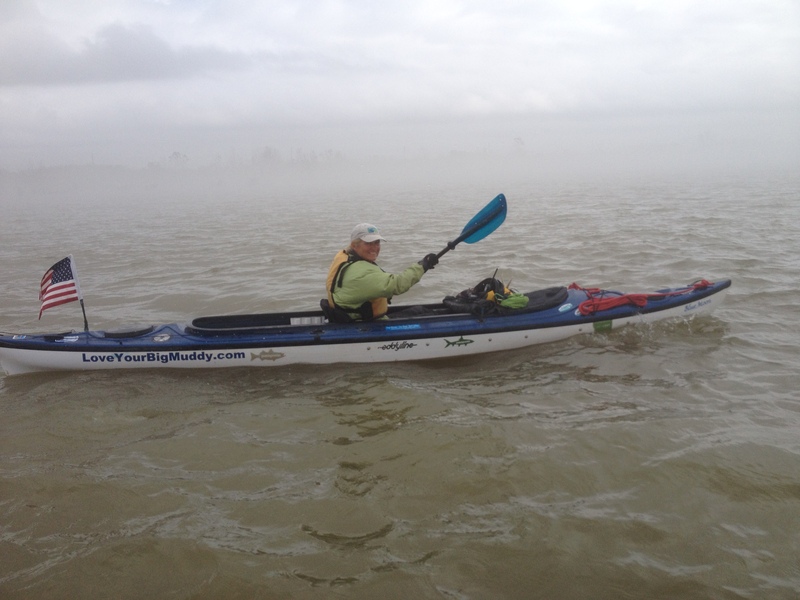 We met at Big Bend Dam and paddled to Chamberlain together. 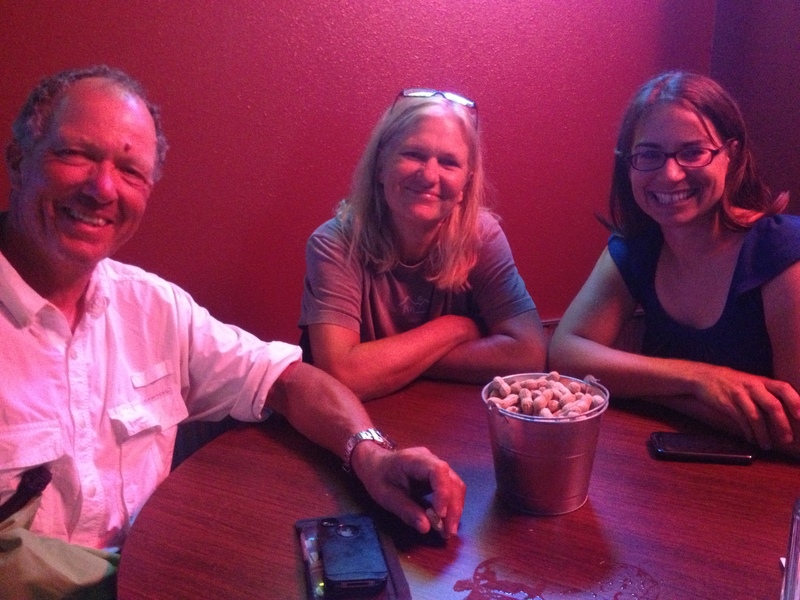 David Forbes, me, and Jessica Andrews Giard, Chamberlain River Angel, enjoying dinner together at the Marina in Chamberlain, SD. 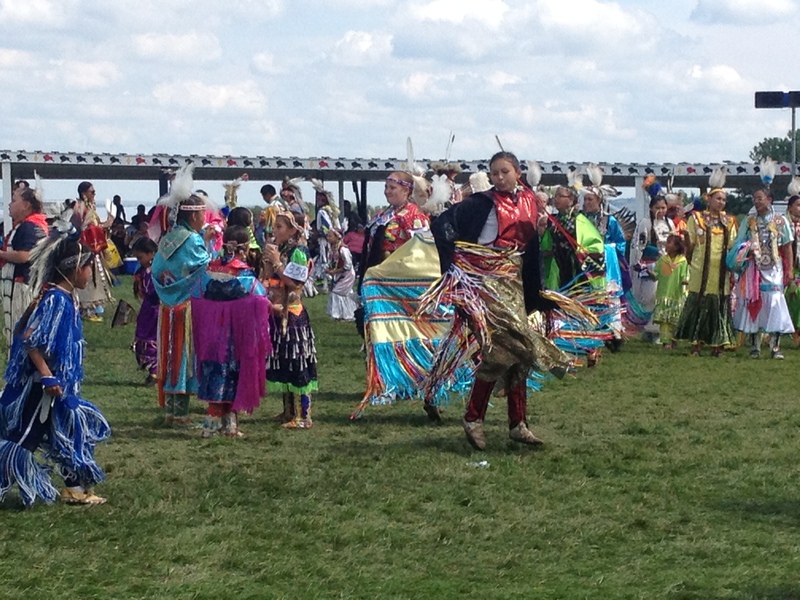 I was intrigued with the Powwow event and the display of American Indian culture. 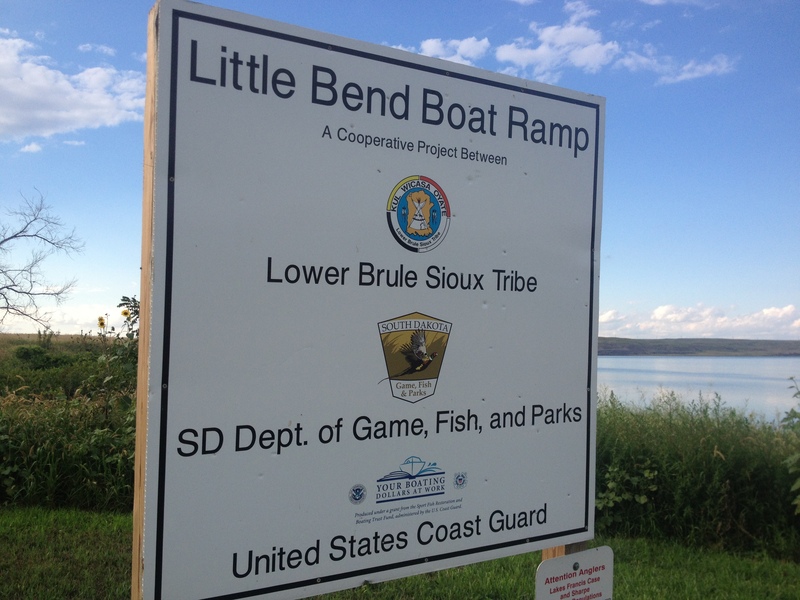 Lower Brule reservation is located right on the shores of Lake Sharpe. I took lots of photos, met some unique and interesting individuals, and thoroughly enjoyed the regalia, dancing and music at the event, the latter of which consisted of many different drum circles. This was a highlight of my expedition. 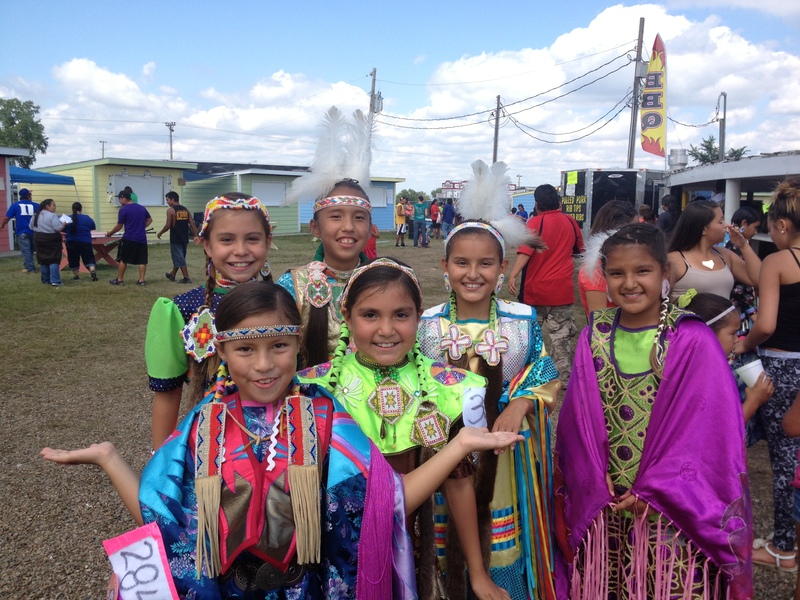 My favorite photo of the journey, these American Indian girls smiled so big for the photo. They appear to be near the age I will be teaching this year, which is 6th grade. I think this was the opening dance when all participate. Spectacular! 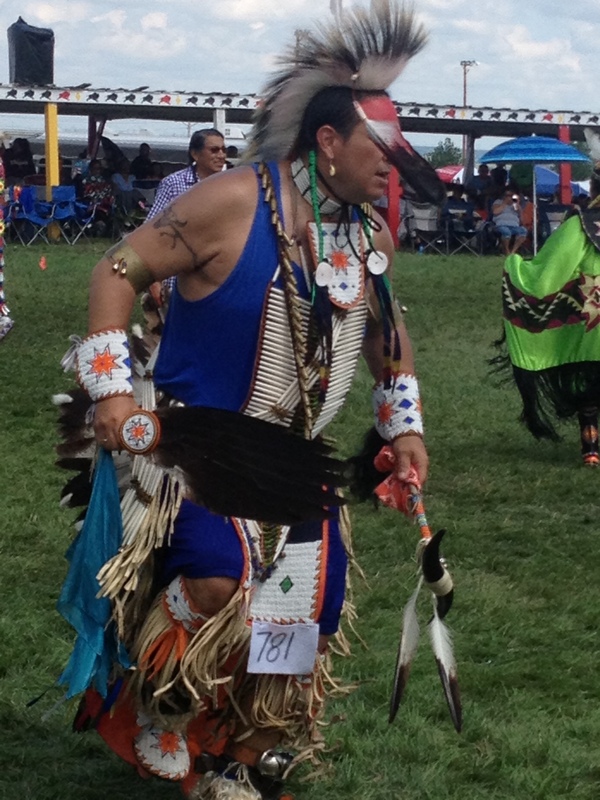 The regalia, drums and dance made for some spell-binding events. Jessica Andrews Giard, Chamberlain river angel, asking a few questions for a write-up in the Chamberlain newspaper. 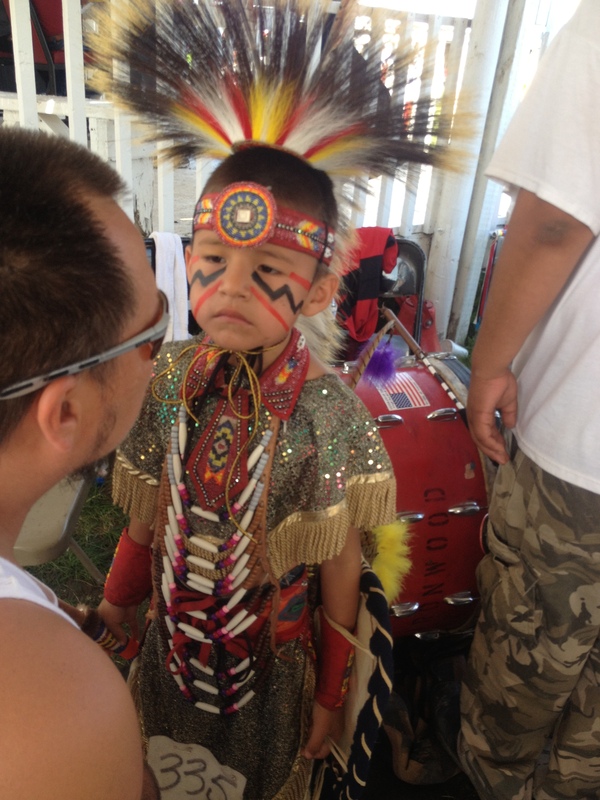 I was awestruck at the traditional regalia on display this day. Truth be known, this one melted my heart. Lower Brule is reorganizing its school system to achieve sustainable success. 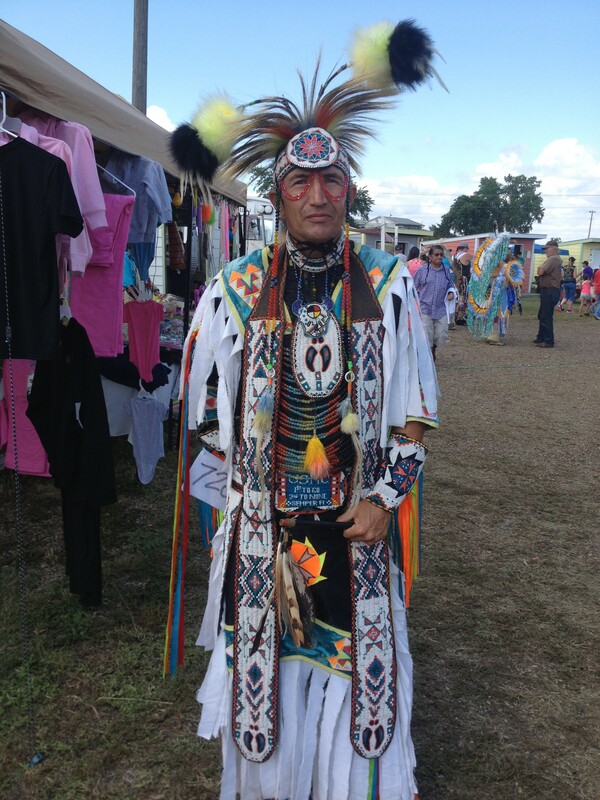 The Tribal Council is working with AIII (A-Triple i), the American Indian Institute for Innovation, making uplifting and relevant changes to achieve post-secondary attendance by graduating high school students who will, ultimately, return to the reservation with their education, leadership skills and innovative ideas. The schools are hoping to achieve an increase in performance standards. I believe the changes in-progress will manifest success and benefits to the Lower Brule community. 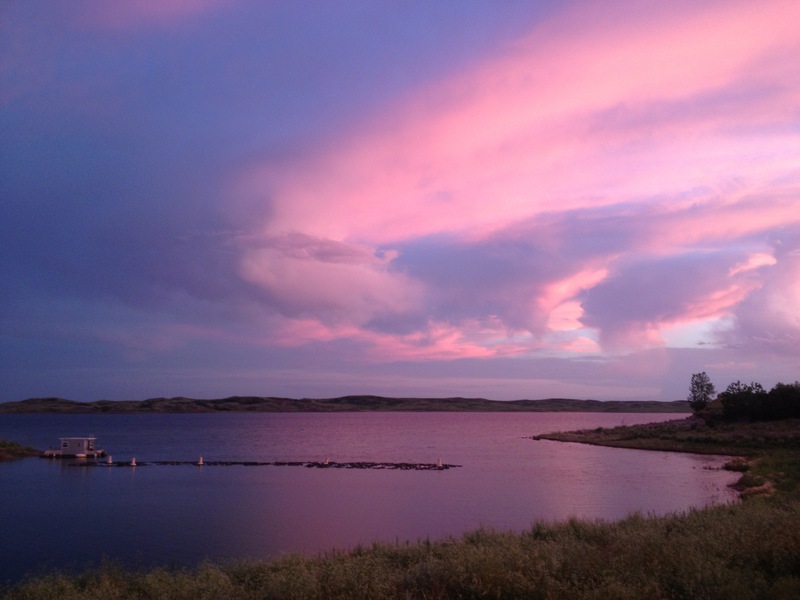 Preferring not to commute the 30 minutes to Chamberlain to live, leaving school at the bell and returning at 7:00 AM, I asked the consulting team leading the reorganization if they could find me housing on the reservation. Indeed, they DID find for me a modest inexpensive home to rent just a few blocks from the school. 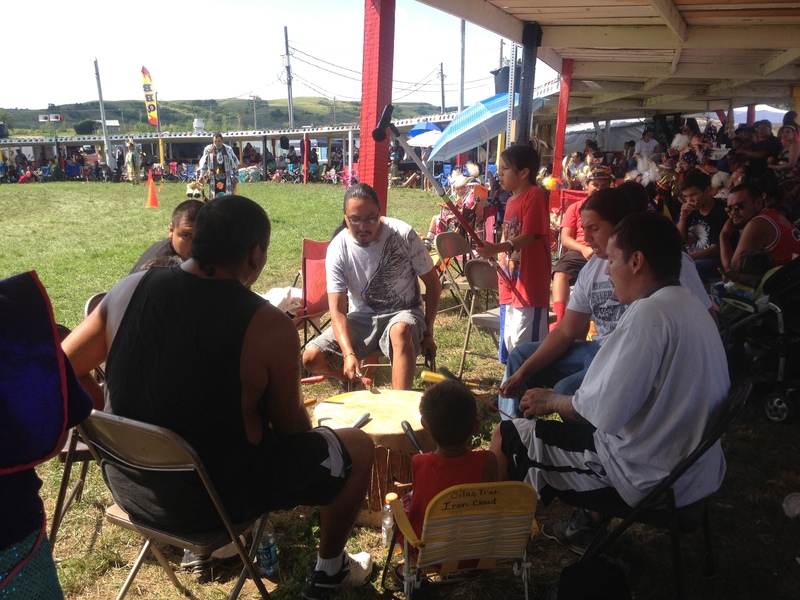 I felt this arrangement was important for immersion with the community and building relationships. 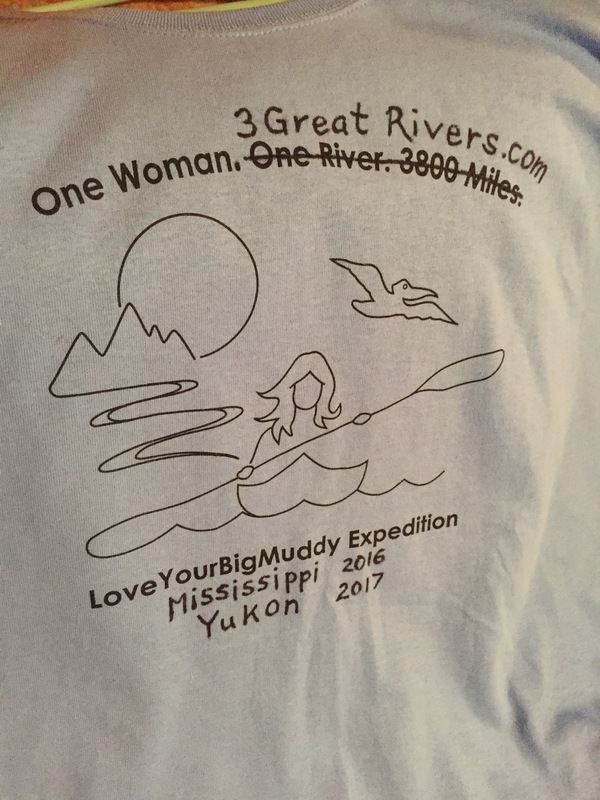 LoveYourBigMuddy Expedition was a life-changing journey like I never expected. 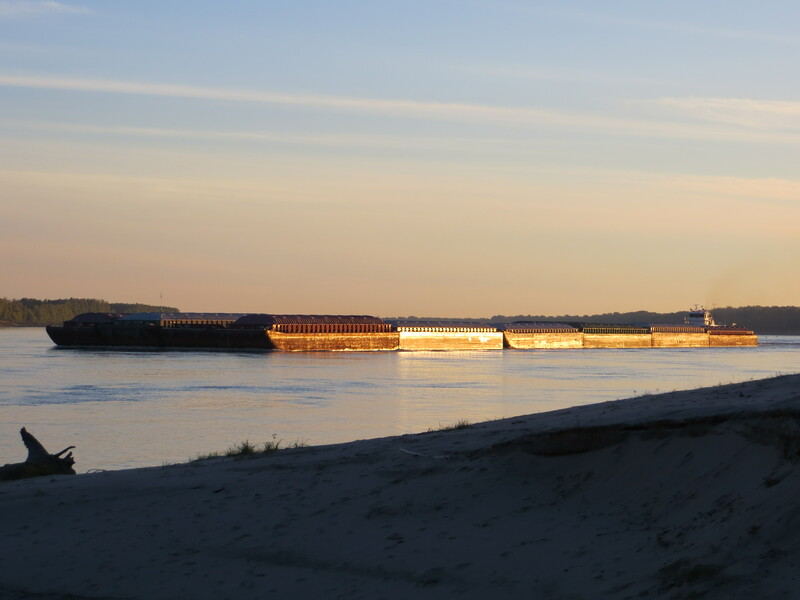 After seven and one-half months living simply on the Missouri and Mississippi Rivers, I now know that my days will continue to be unique while trying to avoid ordinary affairs. Living life outside of the box is stimulating and rewarding. I refuse to melt into an armchair positioned in front of a television or a desk chair in front of a computer screen (well, maybe a little of the latter). Life is so short and at 57 years I can feel the pressure of time passing. So much to do and so little time! 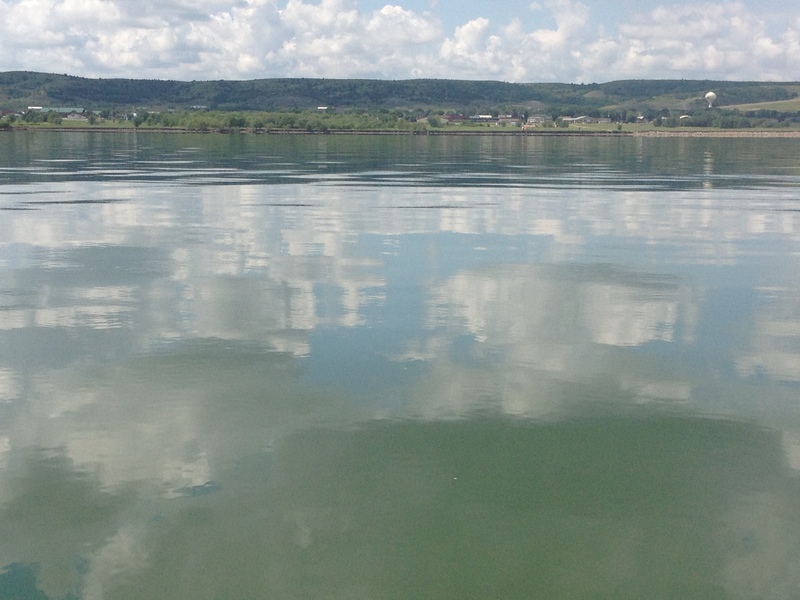 I took this photo on glassy waters as I paddled past Lower Brule. 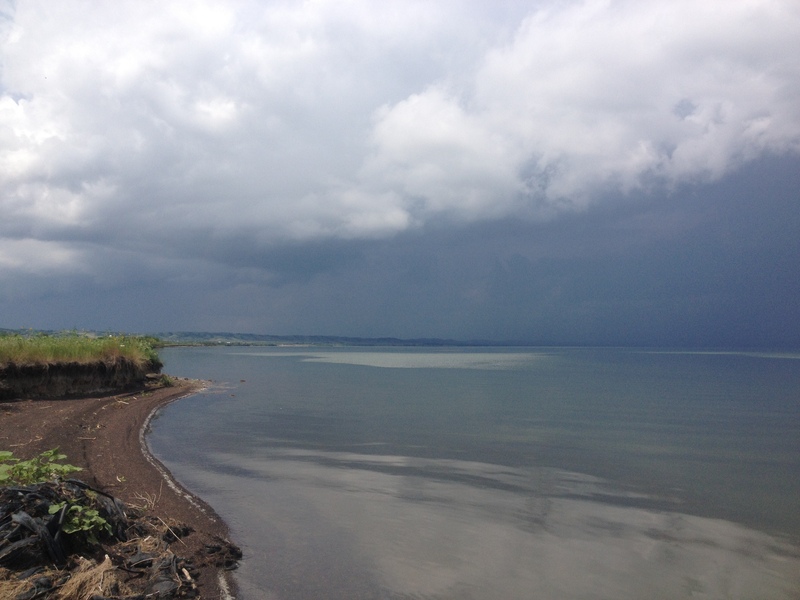 It did not take long for this northern squall to move in. 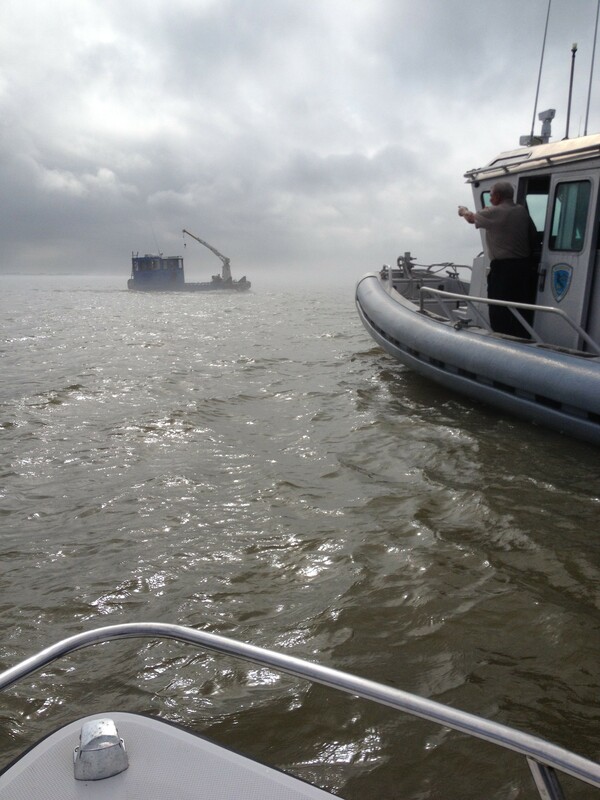 Luckily it broke up over the river after I had moved my boat and gear and me away from the water. The journey is not over until the mission bears fruit. The goals of LoveYourBigMuddy Expedition include 1) empowering youth (women and men) to confidently pursue their dreams and desires 2) conducting effective education in the natural environment, which includes bringing the Missouri River into the classroom and the classroom out to the river and 3) preparing the next generation for impactful stewardship of our nation’s waterways. 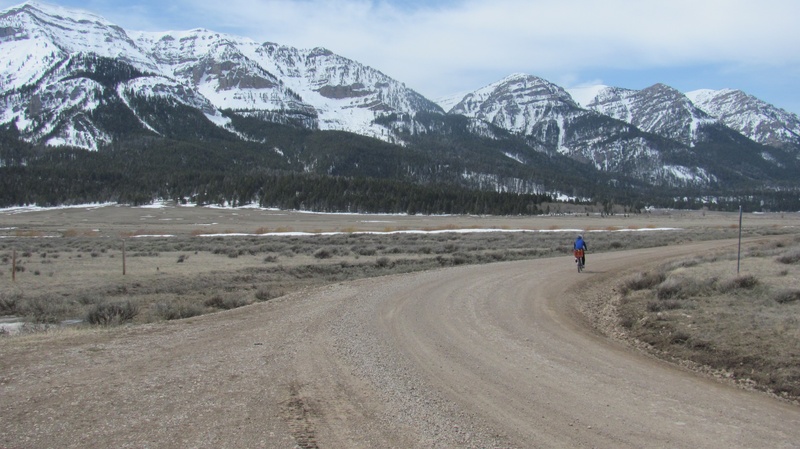 Purposeful living embodies the spirit of adventure. Yep, that’s my story and I’m sticking to it. Coming out from under my tarp which I used to cover myself in a squall. 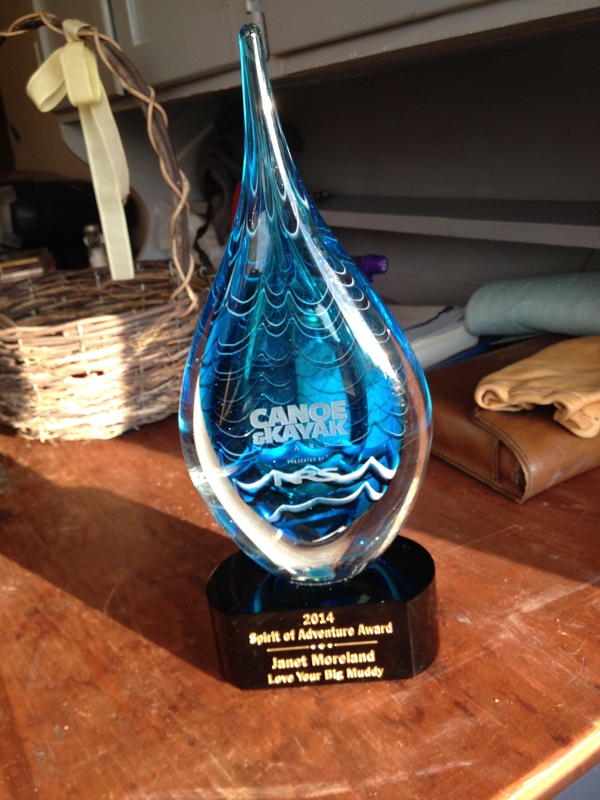 Canoe And Kayak Magazine’s Annual Spirit of Adventure Award. Yep, that could be US! 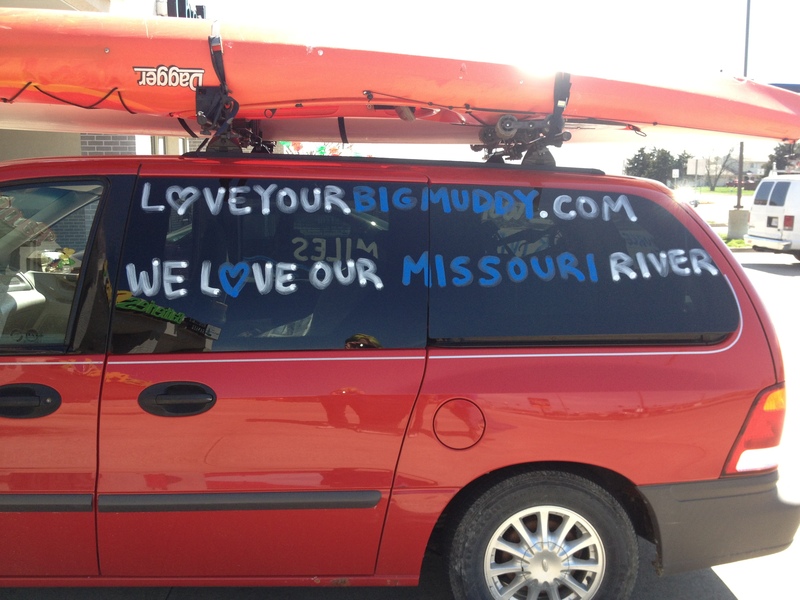 LoveYourBigMuddy Expedition has been nominated for Canoe & Kayak Magazine’s “Spirit of Adventure” Award. I am thrilled for the Rivers! 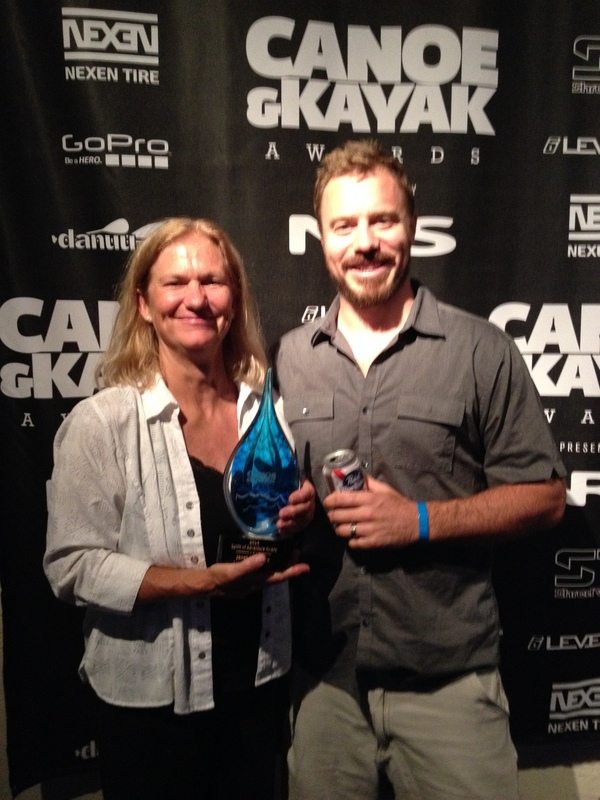 This is the People’s Choice Award in the World of Paddling. Please vote for my (our) expedition if you have a moment. You can vote one time. Voting ends late July. I will be back to write more. I just wanted to let everyone know. 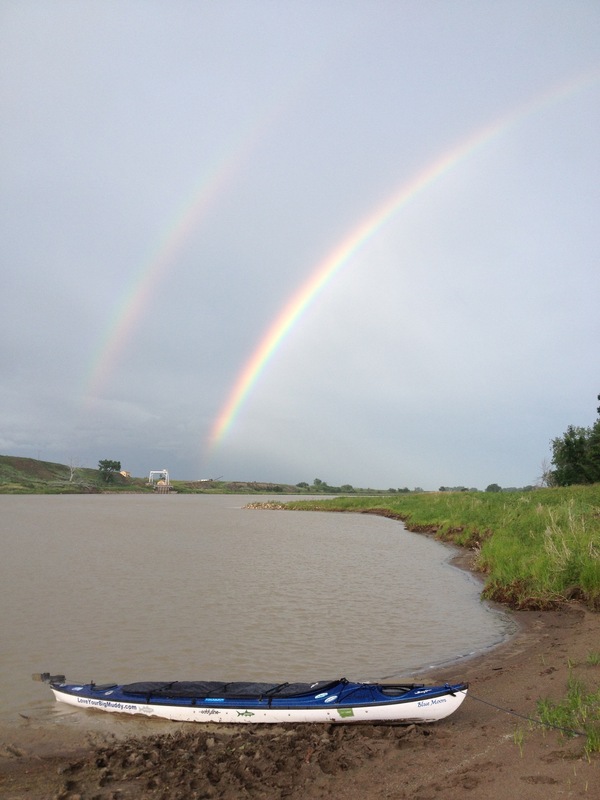 In the link below, Canoe and Kayak pose the question: Does Big Muddy Paddler have the Spirit of Adventure??? HECK YA, we do! WooHoo!!! We GOT this! THANKS ALL! 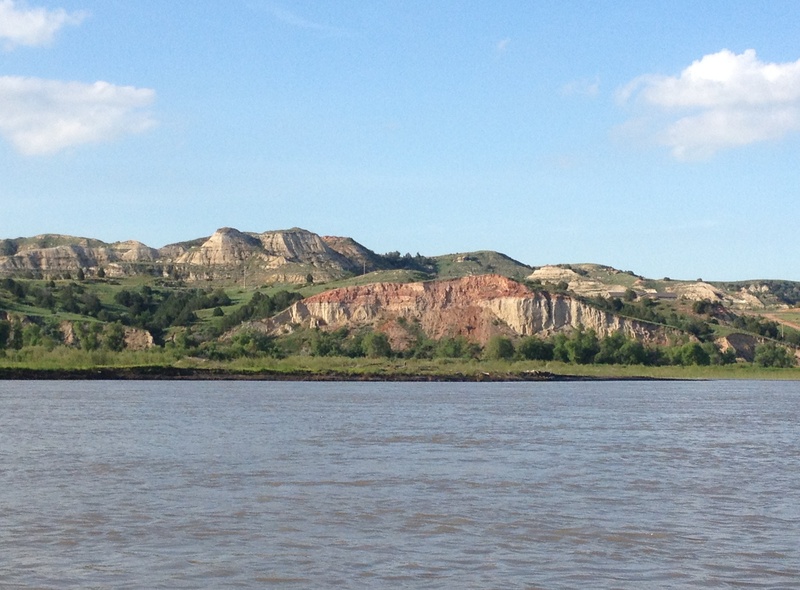 The Missouri River between Peck Lake Dam and Lake Sakakawea. 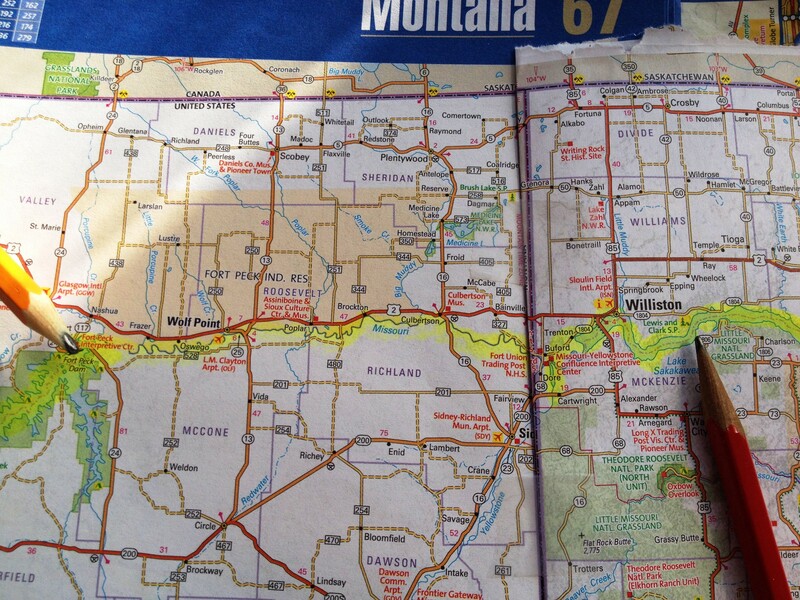 The border of Montana and North Dakota is located right on the crease of the Road Atlas. 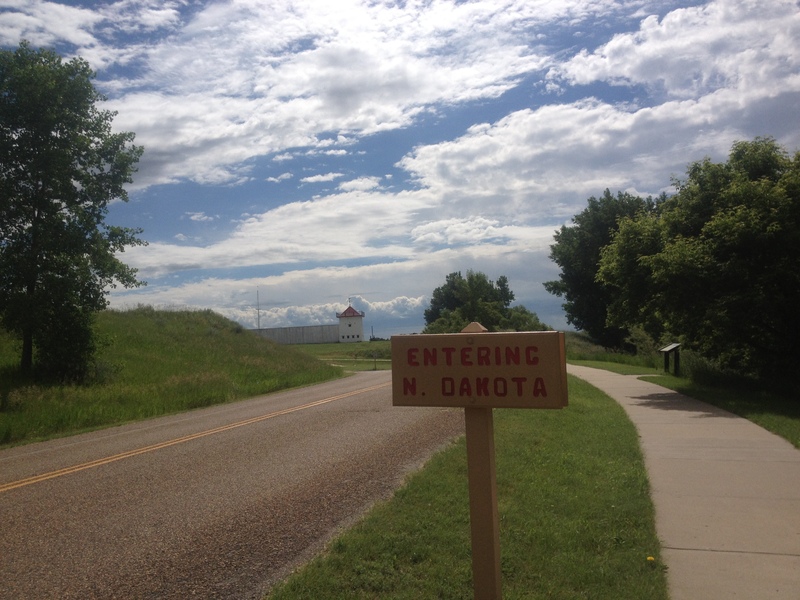 I crossed the border at Fort Union on June 26. 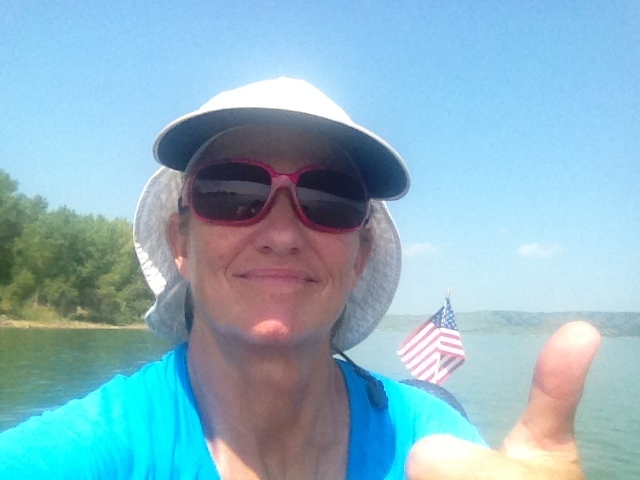 On Monday, June 17, I paddled my final day on Fort Peck Lake. The winds were dead calm and the water so glassy I could see myself in the reflection. I owned the lake that day. I could go anywhere without fear of swamping. 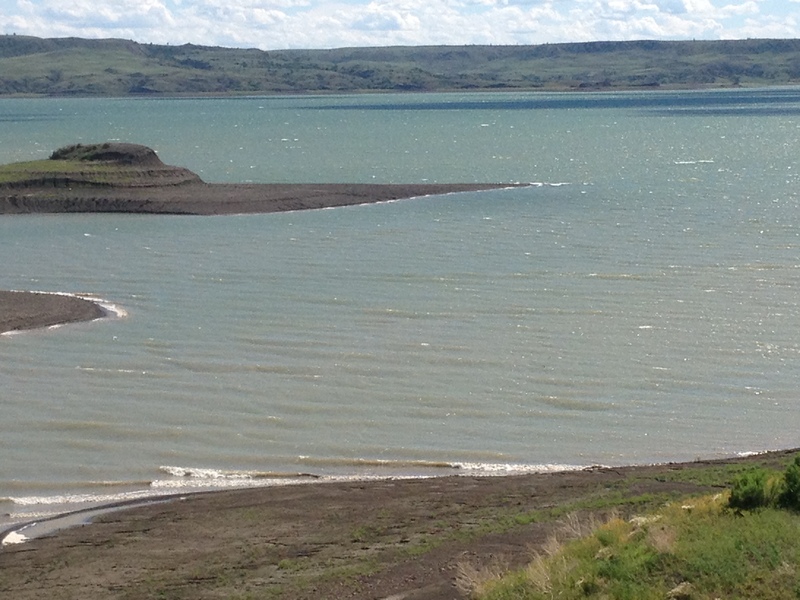 I felt I could cross to the opposite shore all morning long if I wanted, a feeling never before experienced on Fort Peck Lake. This lake is intimidating. We left with a mutual respect for each other. Yes, friends. I knew from Dave Miller’s “The Complete Paddler” that the owner of the marina rented out some RVs with showers. I longed for the moment I could shower and relax. It had been a couple of weeks since I immersed myself in the luxury of running hot water. I did take a sponge bath the first day on the lake, but that was a looooong time ago. Immediately upon pulling in next to the ramp I headed for the office. I asked for the owner, expecting an elderly lady who had been managing the resort for, well, at least ten years. I was surprised to find the owner to be a young woman. 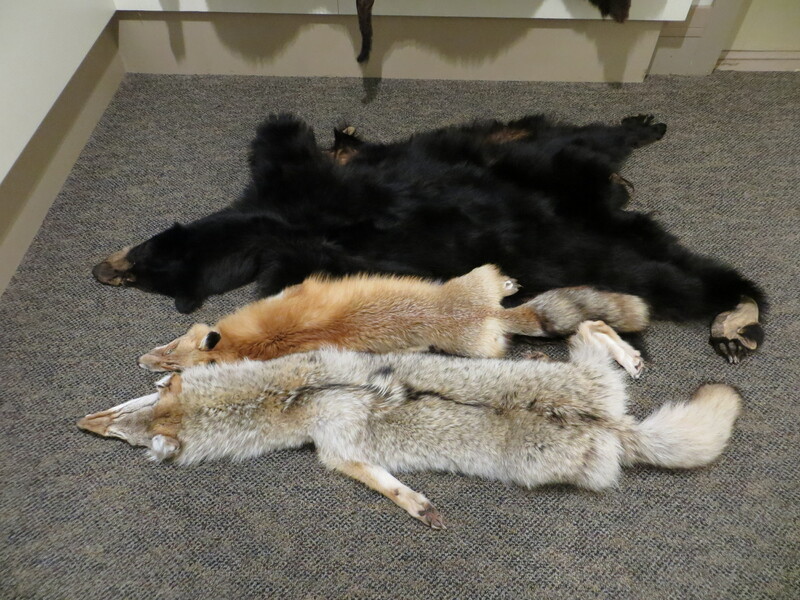 Michelle, the new owner, no longer provided the RVs to accommodate overnight visitors. She did have a house, however, in which she was not living. 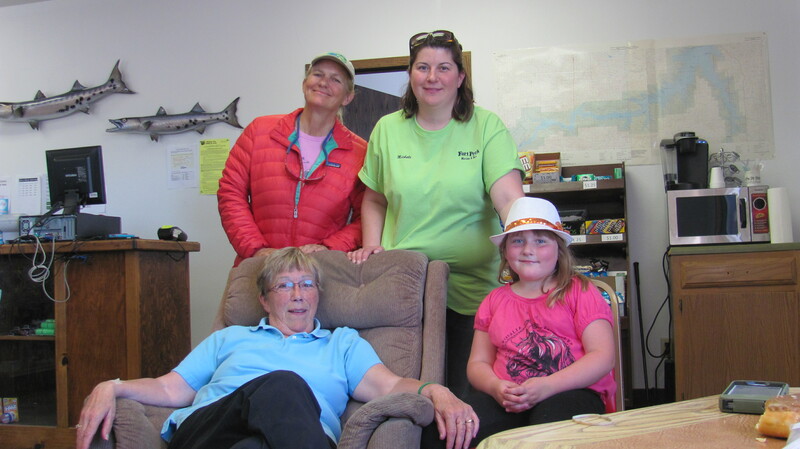 She and her daughter, and husband when he was here, stayed in a large recreational vehicle and used the house for storage, laundry, and showering. Her husband spent half his time working in nearby Sidney, a town near Williston that was also experiencing a massive oil and gas boom. 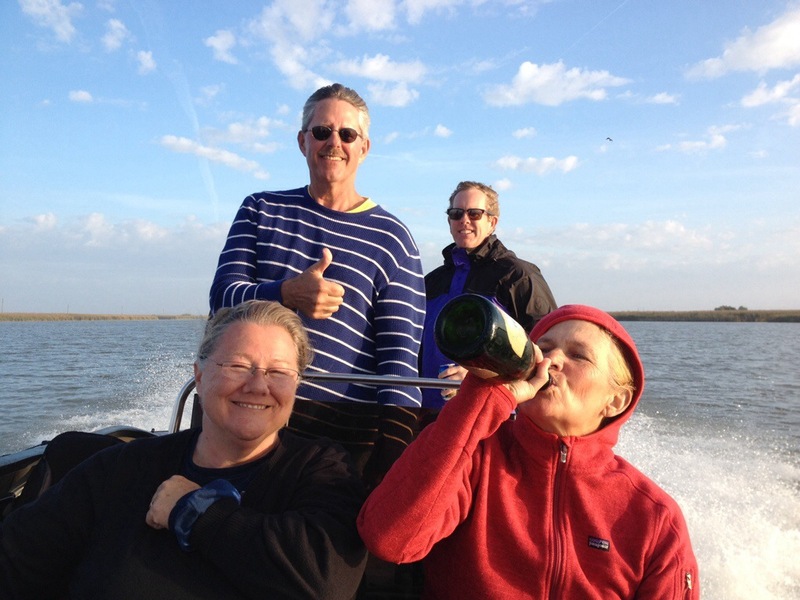 The marina was a new purchase and investment for this young family. 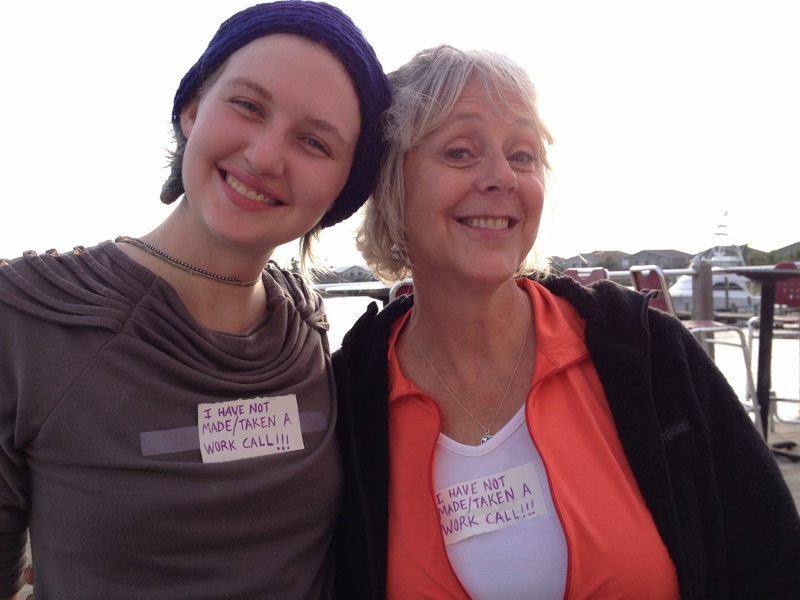 And, they relocated Michelle’s mom, DeeAnne, to live with them and help take care of their young daughter, Allison. I sure appreciated them letting me hang out for a day or two. The house Michelle let me stay in. I helped out with cleaning, babysitting and laundry in return. 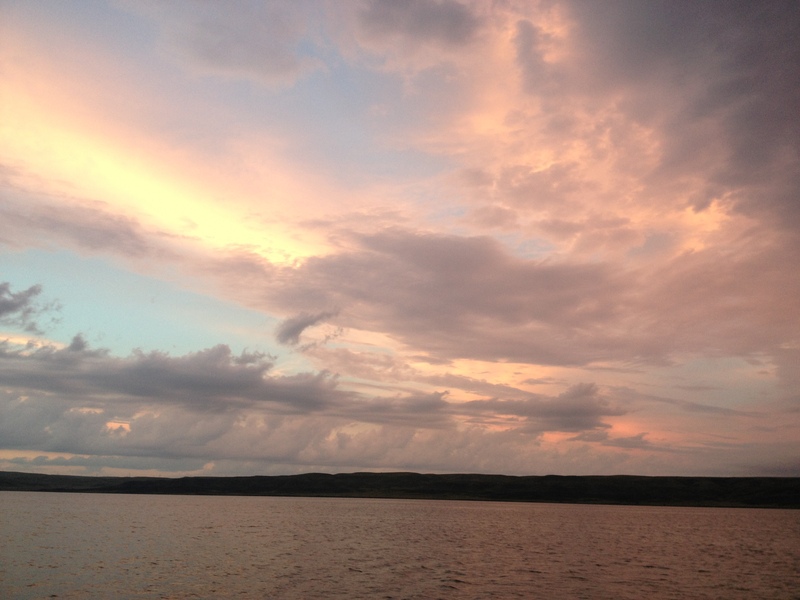 I enjoyed feeling safe and secure and out of the elements after the two long weeks on the lake and in the Breaks. However, by the third day I was ready to get going. I arrived at the marina on June 17. Today was June 19. An intense wind and electrical storm was forecasted to sweep through the area tonight, and I was strongly advised not to go until it passed. 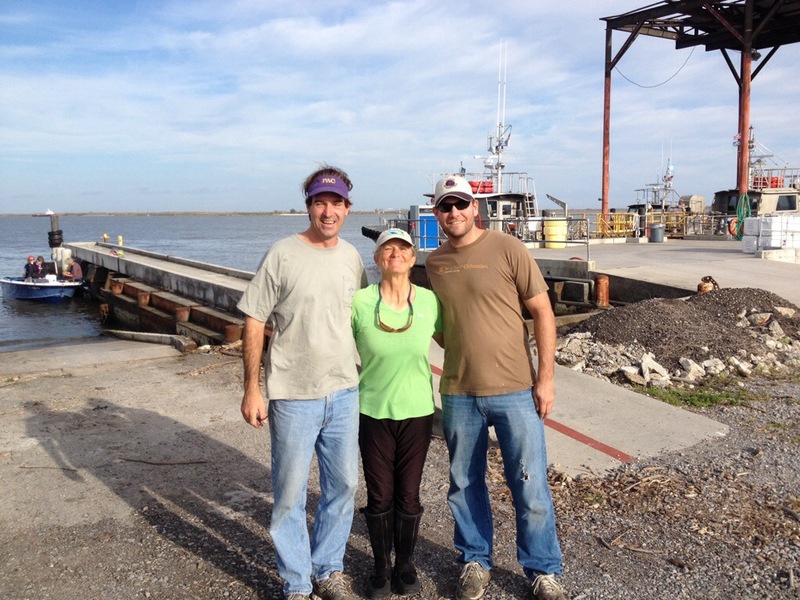 Jack, retired Air Force and new staff at the marina, helped me put my boat in their warehouse. Winds were forecasted to blow 75 mph that night. I survived the storm easily, but soon got word that campers at Eagle Creek in the Breaks did not fare so well. 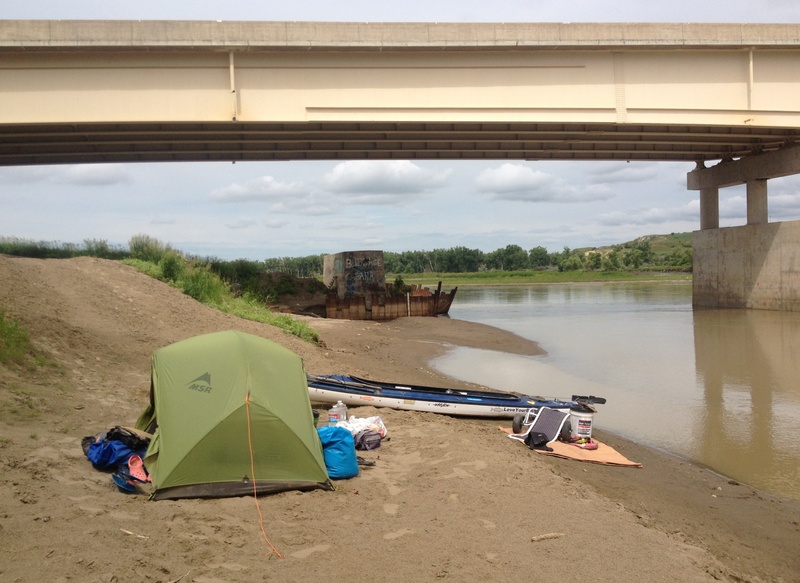 Their tents got ripped to shreds, and a paddler on the Marias River lost his canoe and all his gear, including a case of beer(!) when the wind swept it up and away. 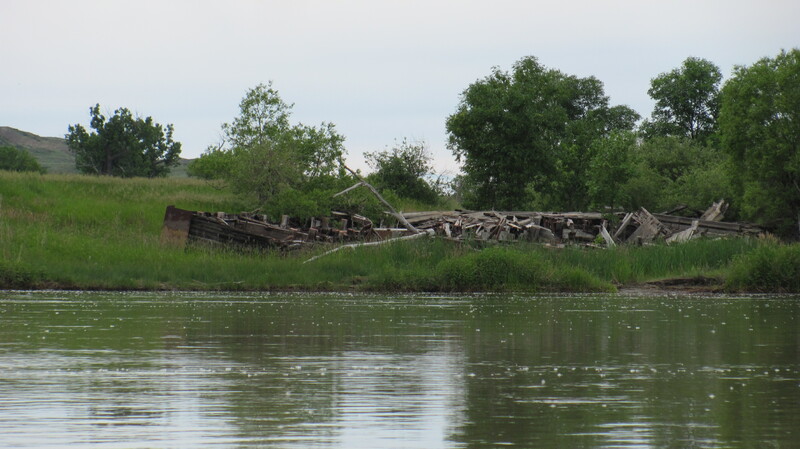 The owner neglected to tie his boat down, a first-time and devastating mistake. I never left Blue Moon unsecured after this night. 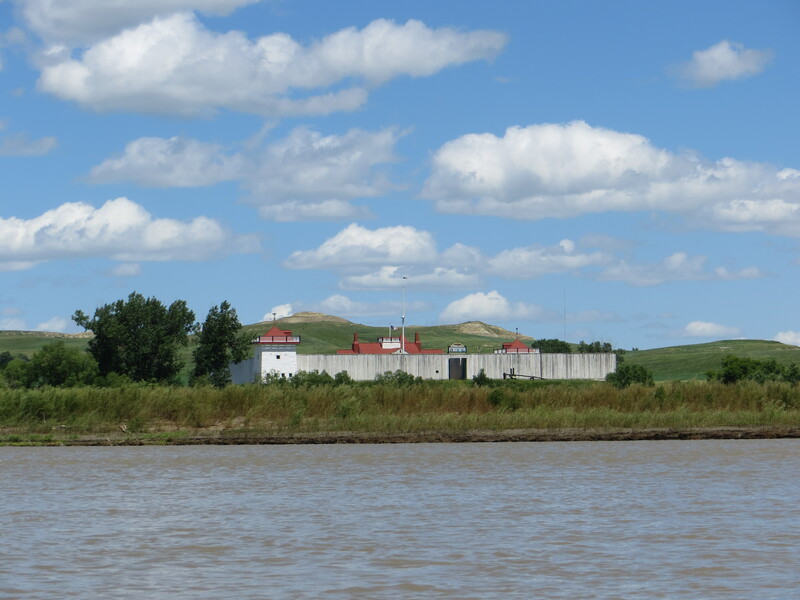 I was grateful for Jack as he took the time to show me around Fort Peck on Tuesday, June 18, and also took me to the Lewis and Clark Interpretive Center below the dam. It was here that I saw the most incredible dinosaur skeletons! Unfortunately, my phone ran out of juice and I couldn’t take any photos. Oh well. Today was Jack’s day off and I was happy he offered to show me around. 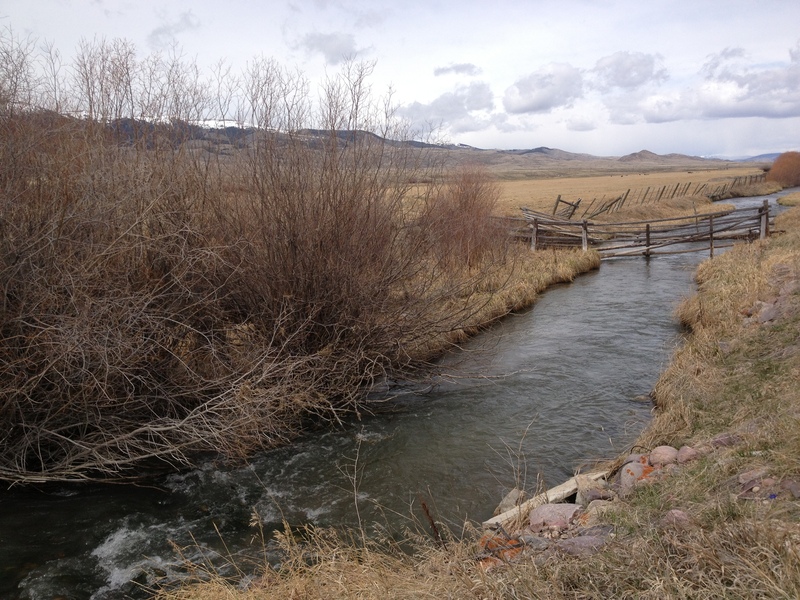 He also agreed to drive me to the put in below the dam the next day, but this was delayed one day due to the big storm forecasted to hit our area, a perfect example of living on “river time.” You just go with the flow and try to stay flexible. 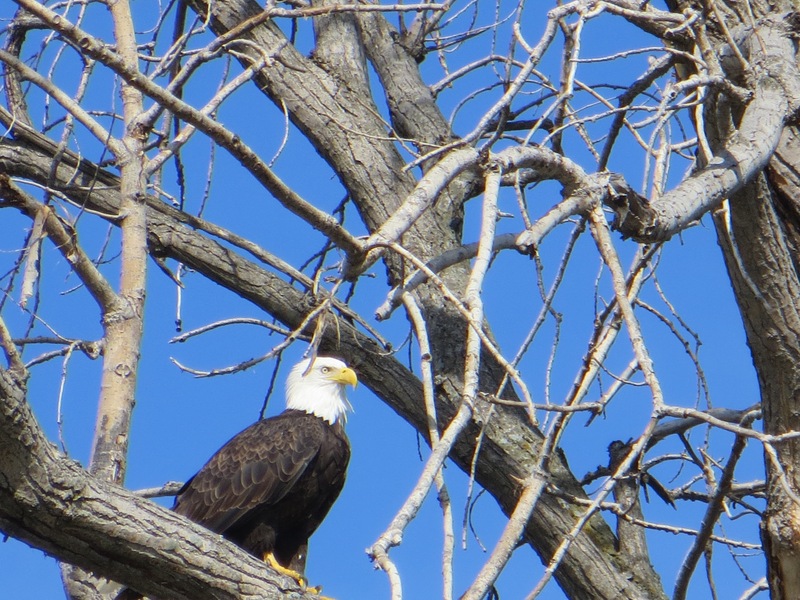 My best friend on the Missouri River. Don’t leave home without it. Local testing his new invention. I call these snags “shipsinkers.” 300 steamships met their demise because of the damage caused by these snags. 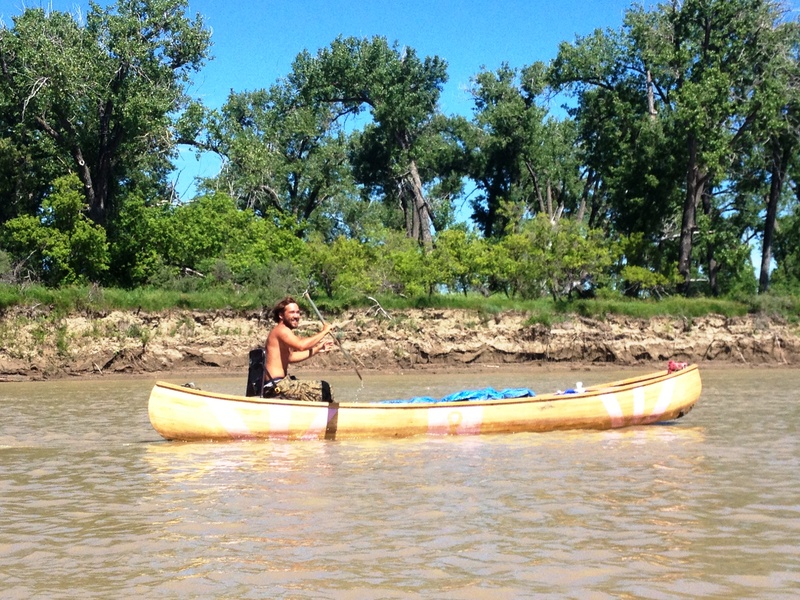 I spent about a week or so paddling the stretch of river between Fort Peck Lake and Lake Sakakawea. 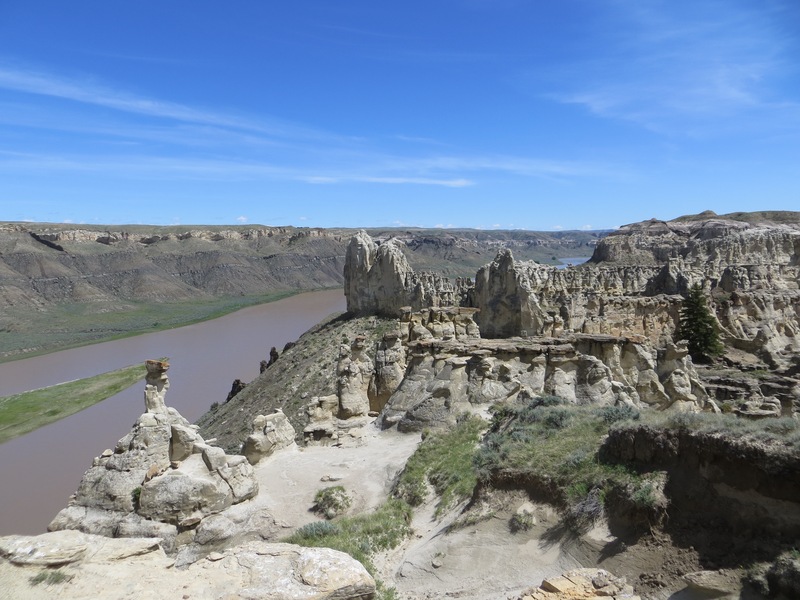 I had heard a lot about Wolf Point on the Fort Peck Indian Reservation, and that it was probably not best to stop there. Well, I passed by at 5:00 in the afternoon on Saturday with no real reason to stop. I did not see anyone around, either. Well, I saw one guy. He was in a big beautiful canoe paddling down the river. Wow! Who are you?? 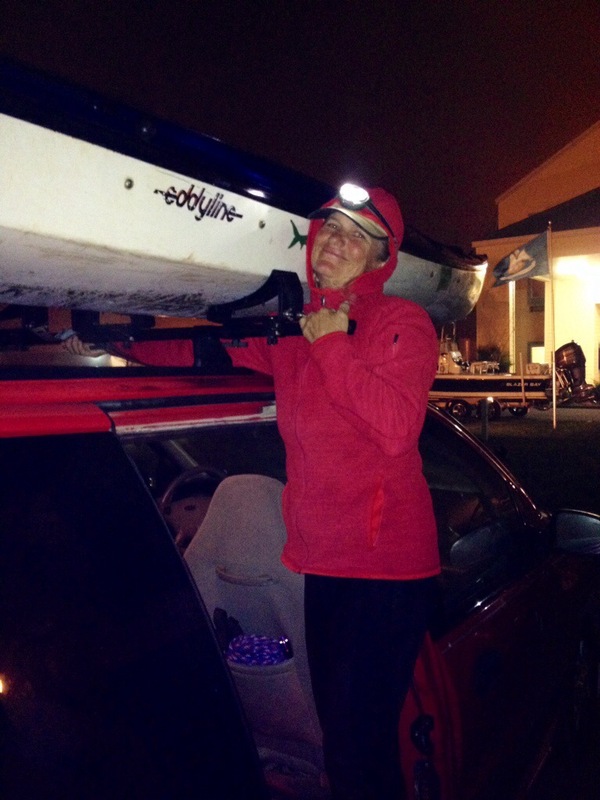 I asked , surprised to see another paddler of whom I was totally unaware. “I’m Shawn Hollingsworth,” he replied. “Where are you from, paddling from, and to where are you paddling?” I asked, standard questions asked of any paddler you meet on the river. This was the beginning of a real sweet friendship. 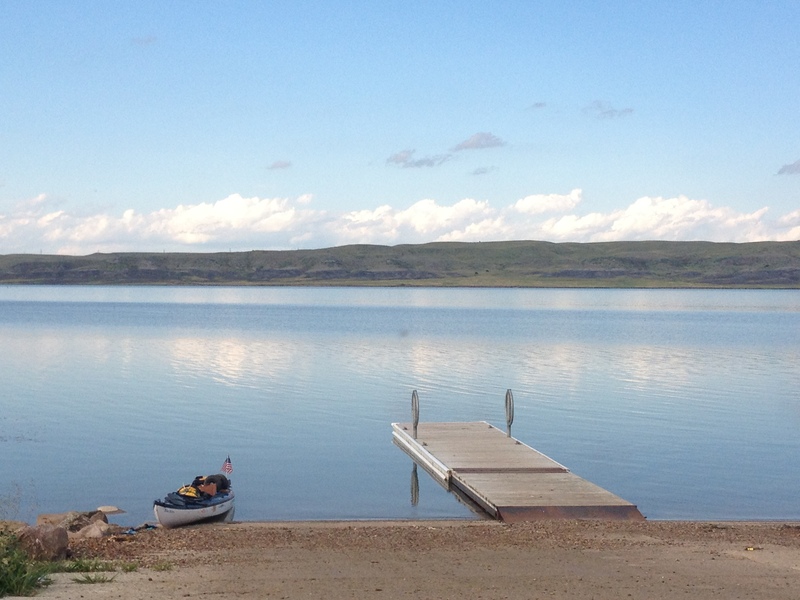 Shawn and I paddled off and on for the next week, until we were both situated on windy Lake Sakakawea. 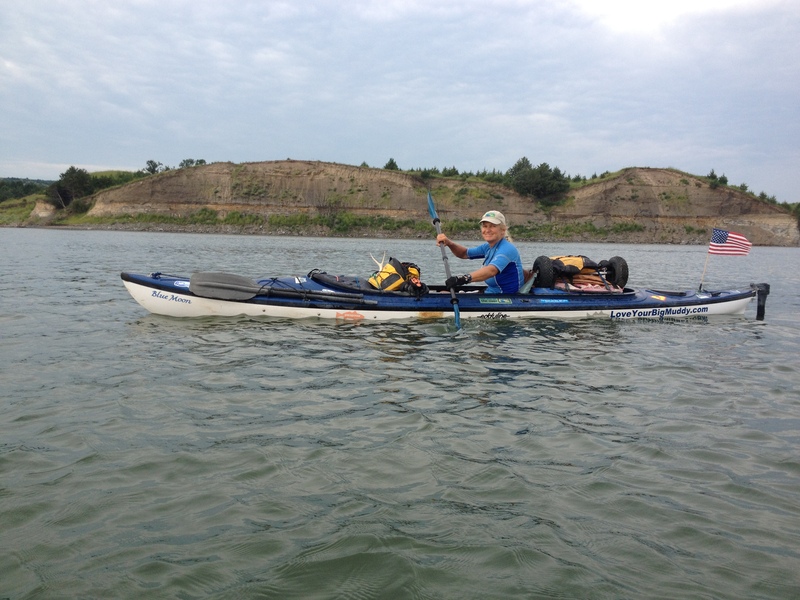 I remember Shawn telling me that Bob finally flew off when Shawn was behind me, paddling through the river-to-lake transition onto Lake Sakakawea on June 28. Most days we did not paddle much together since he was slower in the canoe, but he always seemed to make it to my camp in the evening, much to my delight. He was such good company and, at 23 years old, was on the adventure of his life. 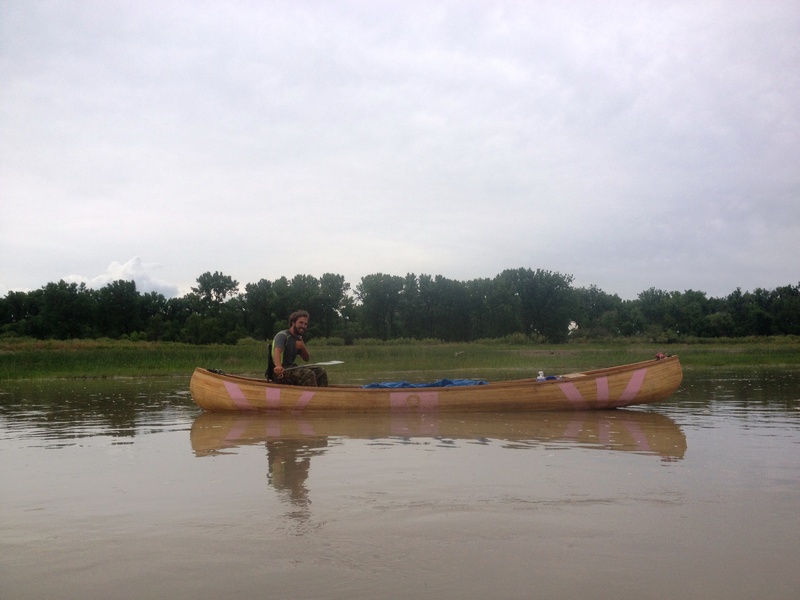 Shawn Hollingsworth in his self-made canoe. Shawn was raising awareness for breast cancer. I loved spending time with Shawn. I was so proud of him embarking on this adventure alone after his two buddies left him. 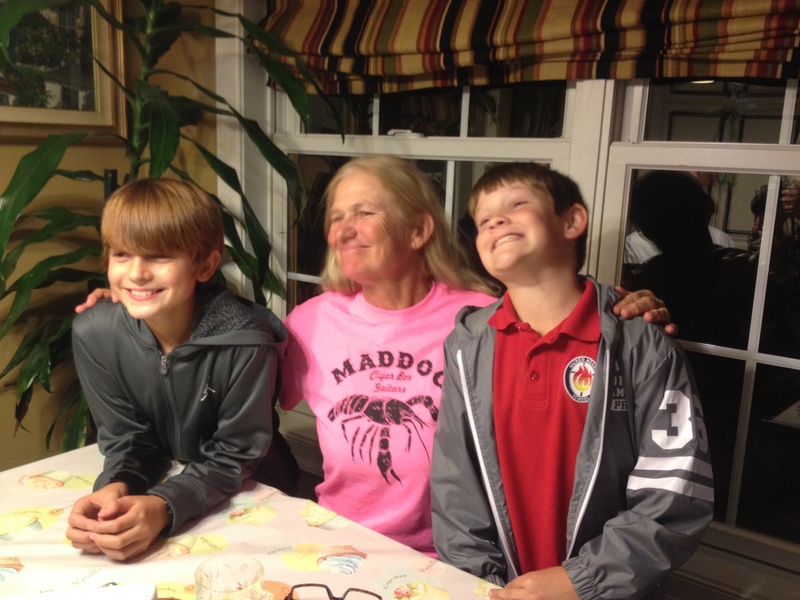 One left him two weeks before leaving Virginia Beach, the other left him after a harrowing crossing of Fort Peck Lake. 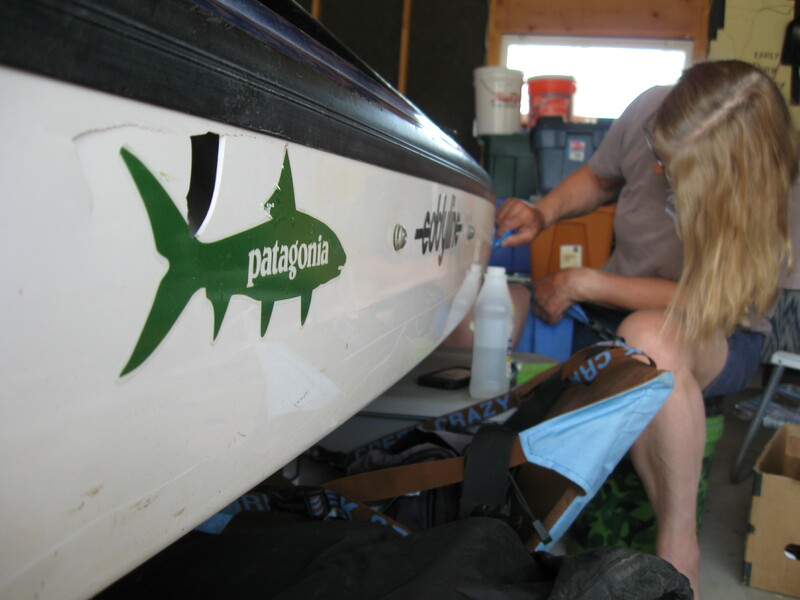 Shawn had never paddled before and now was left to skipper a three-man canoe, which he made all by himself. Plus, he was raising awareness for breast cancer. I was happy to share with him some tips on reading the river and waiting patiently during high winds, the latter of which guys find most challenging. 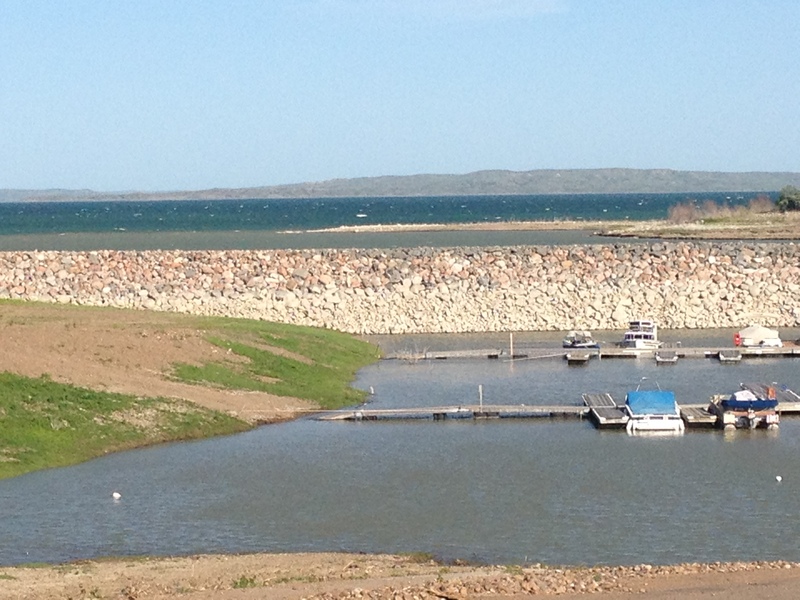 Paddling in extremely high winds on Fort Peck Lake nearly killed Shawn and his paddling partner. 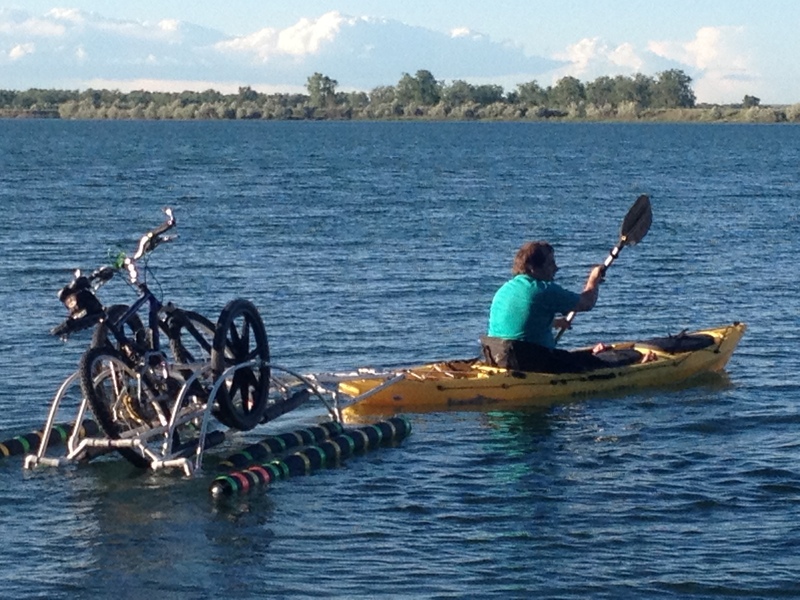 They ended up getting towed off the lake and his partner decided to call it quits. Another paddler had swamped a couple of weeks earlier in big swell generated by high winds. 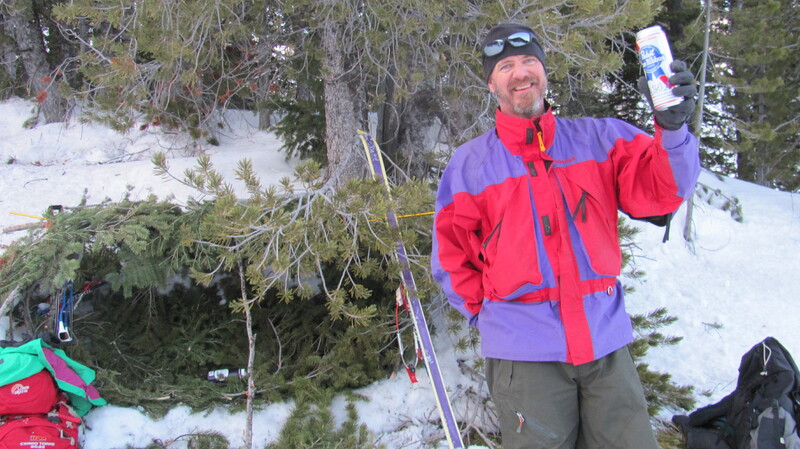 He lost his tent, sleeping bag, cell phone, and his adventurous spirit. He nearly died from hypothermia, and ended up leaving his partner as well. Waiting through big wind sessions on these big lakes is all part of the game. Impatience must be replaced with going for a walk, reading a good book, exploring the beaches and hills, or whatever else one does to entertain themselves. It is a matter of life and death on these big lakes. 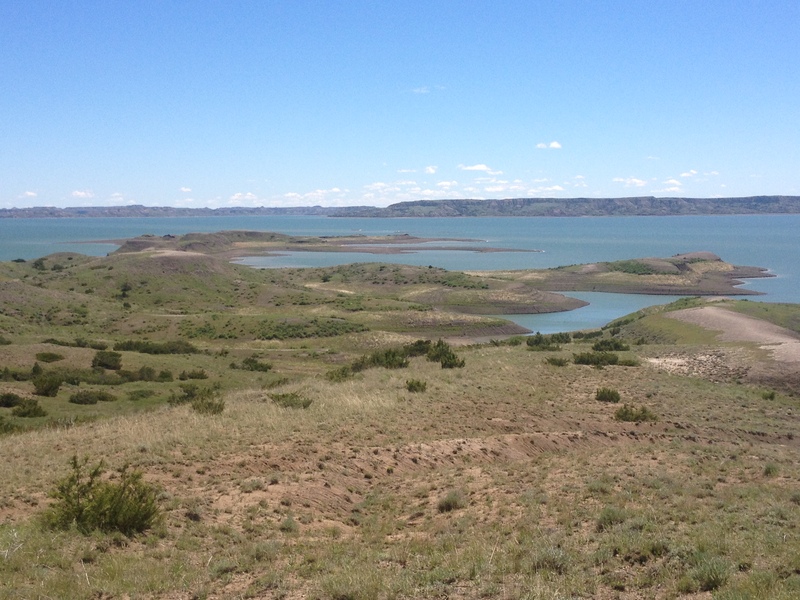 Fort Peck Lake-Hiking the hills was a good way to wait out the wind. 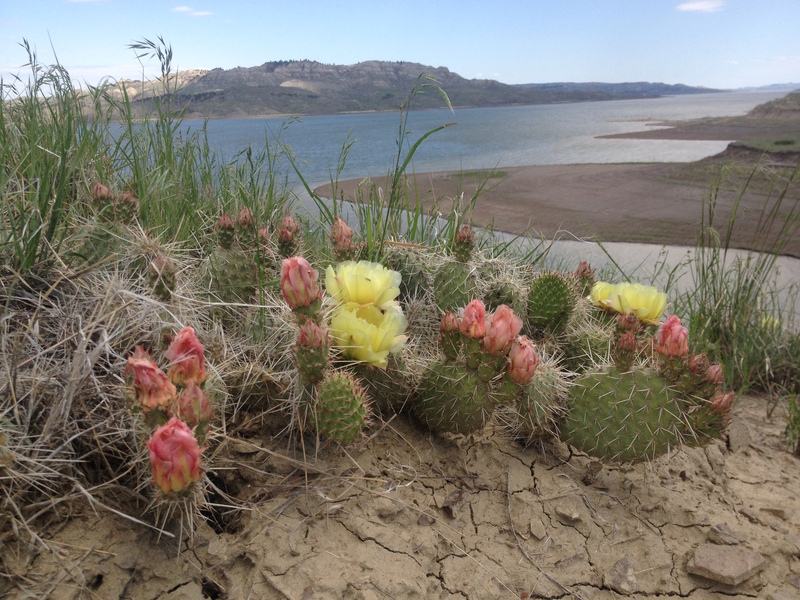 Fort Peck Lake-Patience is a virtue, difficult to master at times, but necessary. Great hiking areas help. 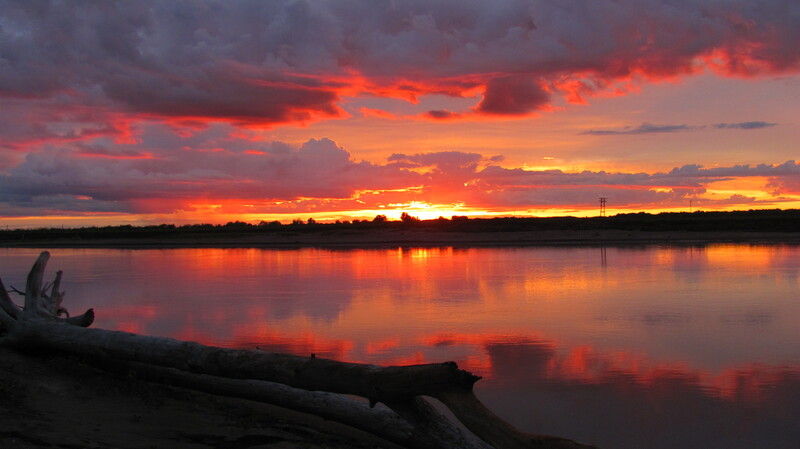 On my second night of camping back on the river I saw the most exquisite sunset I had ever seen. I almost missed it while putting up my tent and battling the mosquitoes. I think this is the worst mosquito deluge of the whole trip. 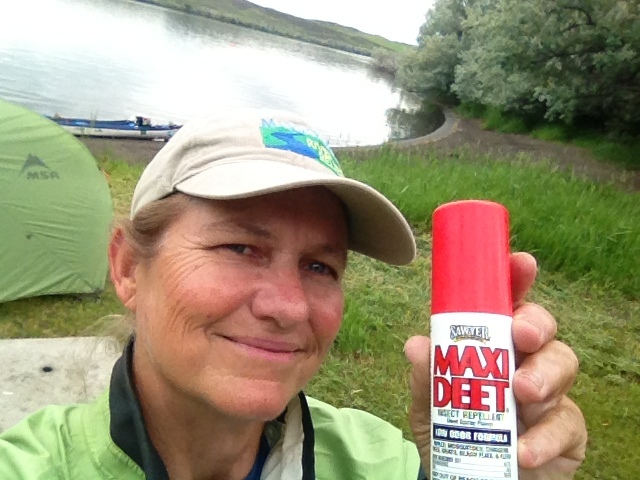 Thank God for my 98% Deet. And, for the stunning sunset that night. I think this photo generated more hits on Facebook than any other during my whole trip. 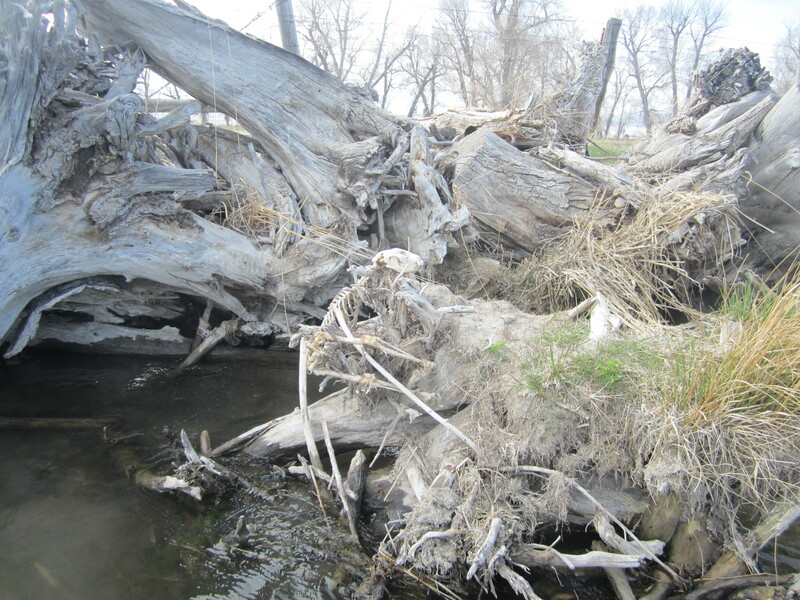 Well, except for the skeleton plastered up against the snags on the Beaverhead River. That was a good one, too. 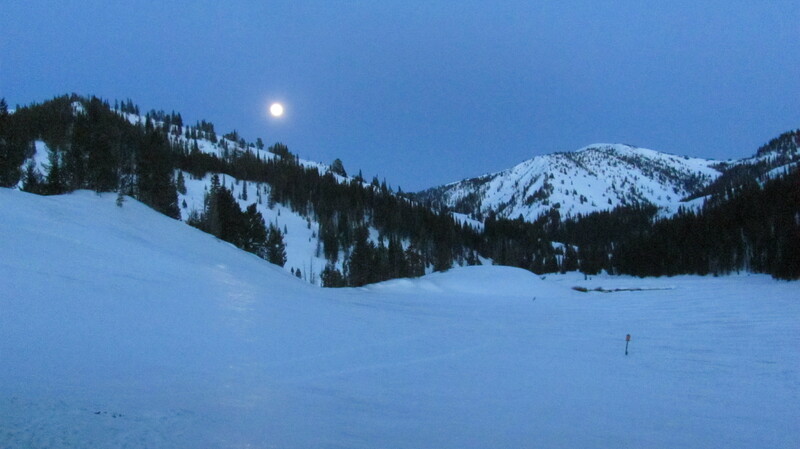 This photo, along with the sunset pic below, were the most popular expedition posts. 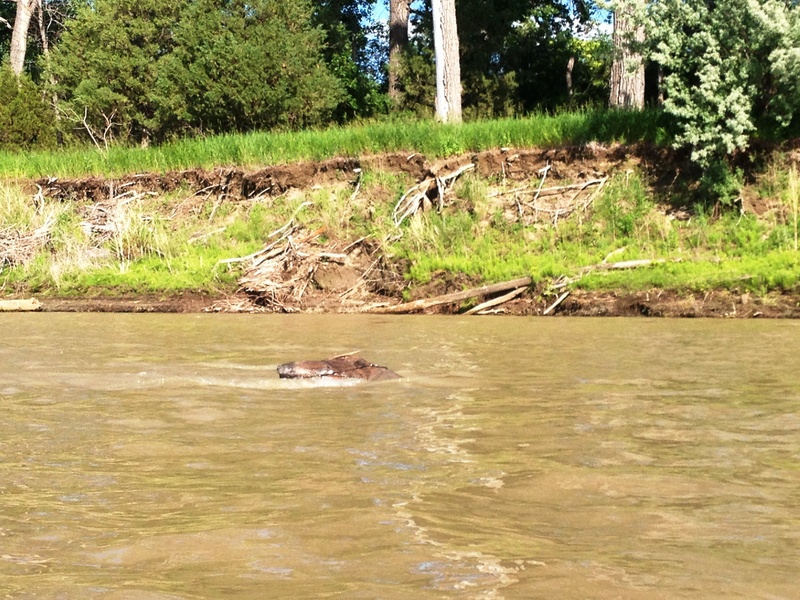 Taken on the Beaverhead River, Day 1 on the water. Here is a little video I shot just prior to taking this photo. 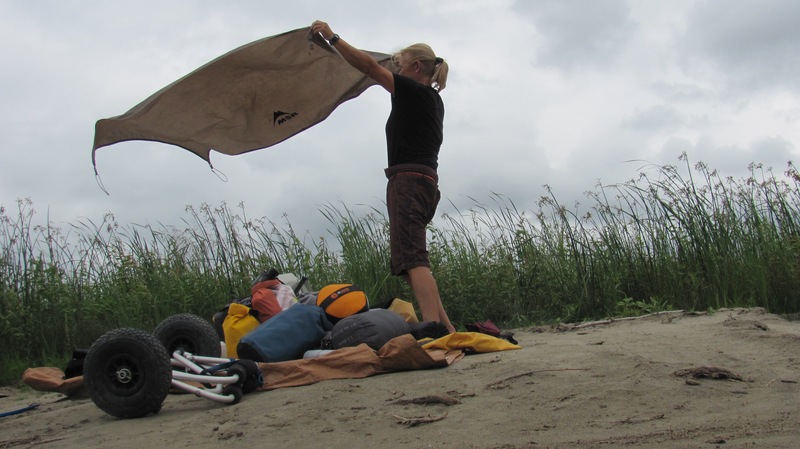 After the little video, I began setting up my tent and packing everything in it. I just happened to turn around and noticed the sunset was in full swing. I grabbed my camera right away and got several good shots. I was stunned at the magnitude of colors displayed. 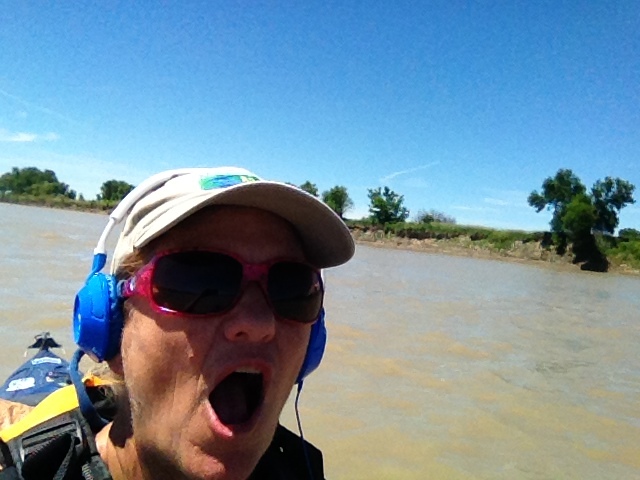 I made it to the Highway 16-Culbertson Bridge on June 24th. Situated just past the reservation, I decided to camp here after some locals said they thought it would be safe. Not long after I landed I met Glenn Stewart, who hollered down from atop the bridge. 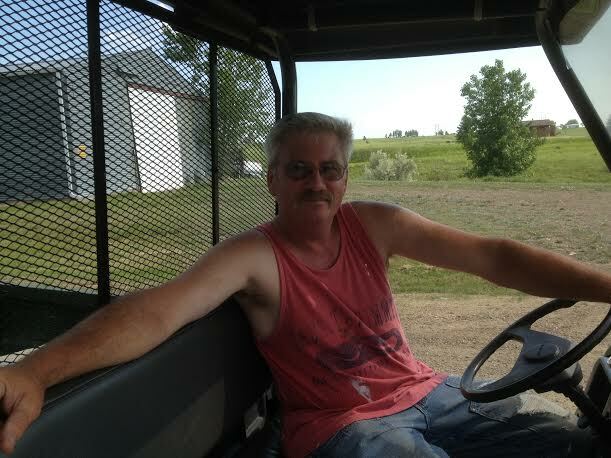 He was working on the road crew and, after talking to him, he immediately became interested in my journey. If you need to go into town and have breakfast or go to the grocery store, we’ll be here tomorrow and you can just take my car into town. Wow! A true river angel with a generous heart to help. Thanks, Glenn! Glenn and his son, Kelly, and his wife ended up following the rest of my trip on Facebook. Shawn showed up the next morning when I was getting ready to leave. Glenn offered him his car and he was able to make it into town, too. Shawn wanted to stay here and rest up. I did not know when I would see him again. 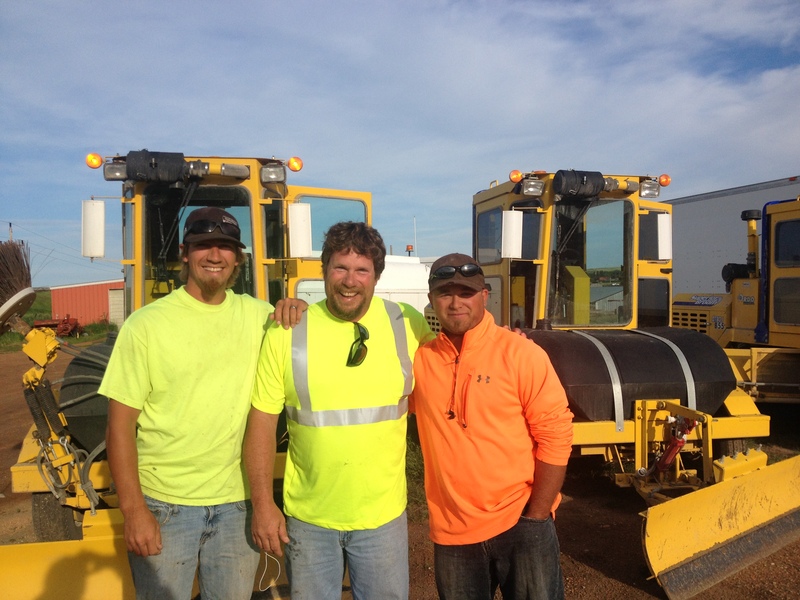 Kelly (left), Glenn and fellow road crew coworker. Good people! I ended up going into town the next morning after a pretty good storm hit. Some kids came down to the bridge that night and played some decent country music and lit off fireworks. 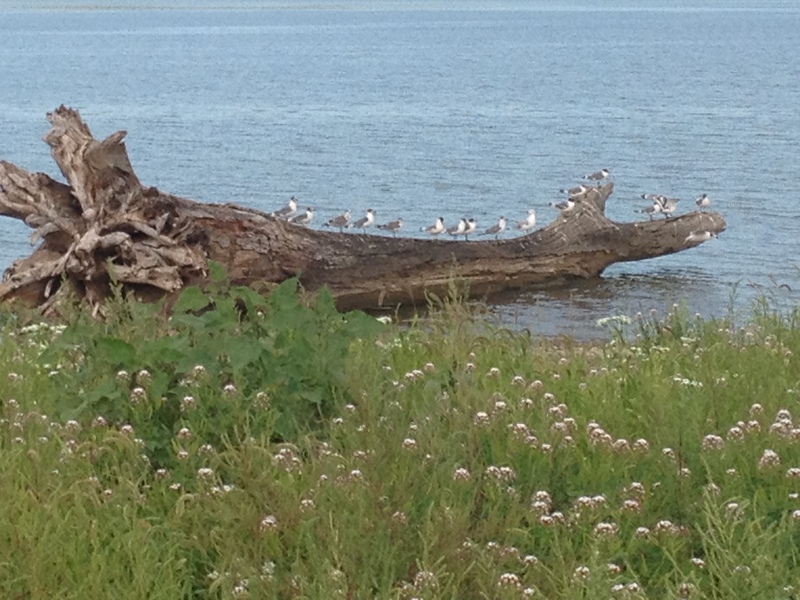 I almost got up to join them, but didn’t want to spoil their summertime river experience. I’m old, you know…LoL! It’s what memories are made of, right? 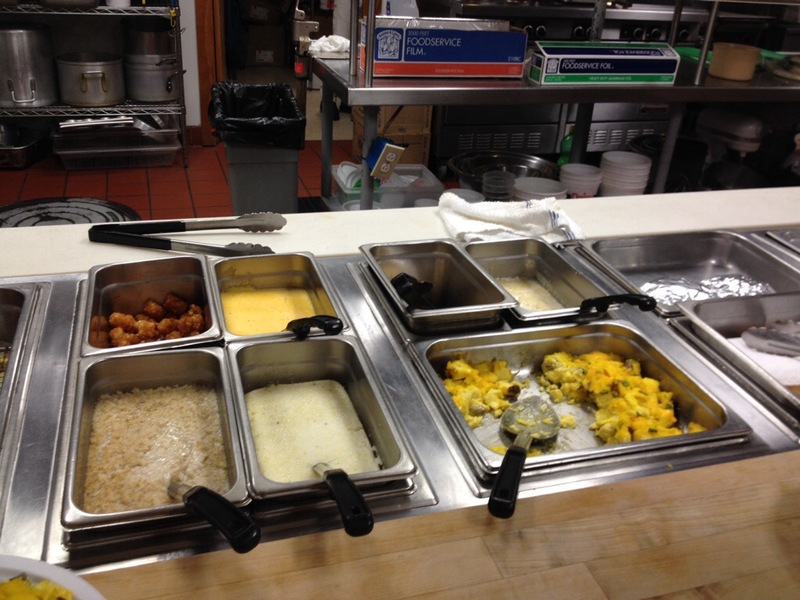 I slept good after they left, woke up with sand in my tent, but forgot about any discomforts as I ate my ham and eggs breakfast at the Wild West Diner in town. 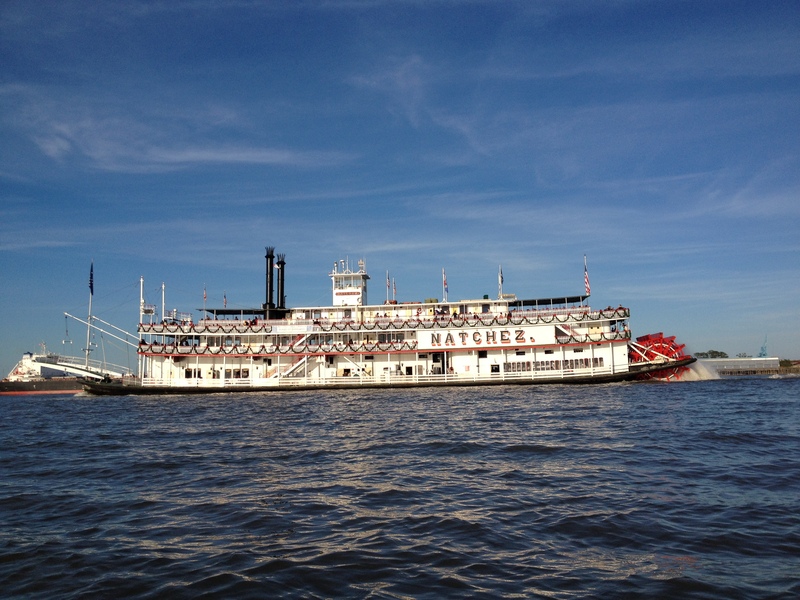 I loved singing along to river songs while on the river. Too fun! 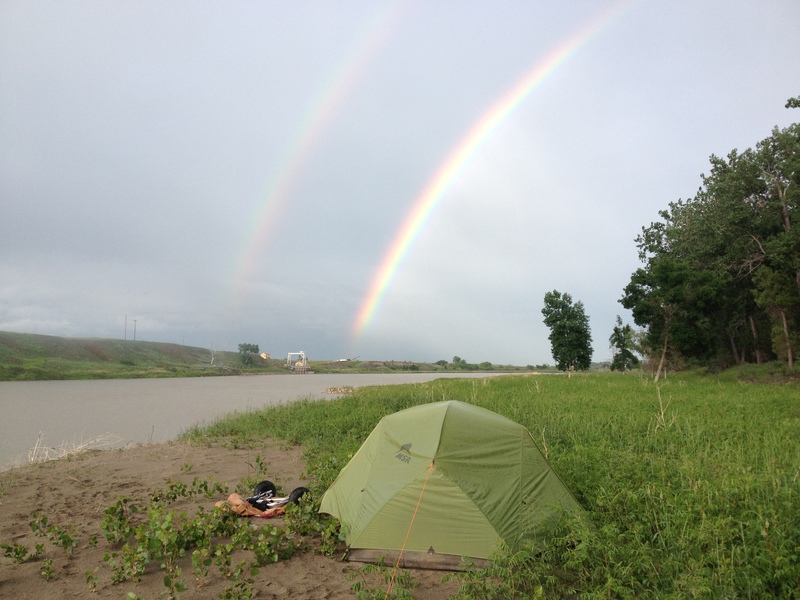 I camped just a few hundred yards from the Montana/North Dakota border. 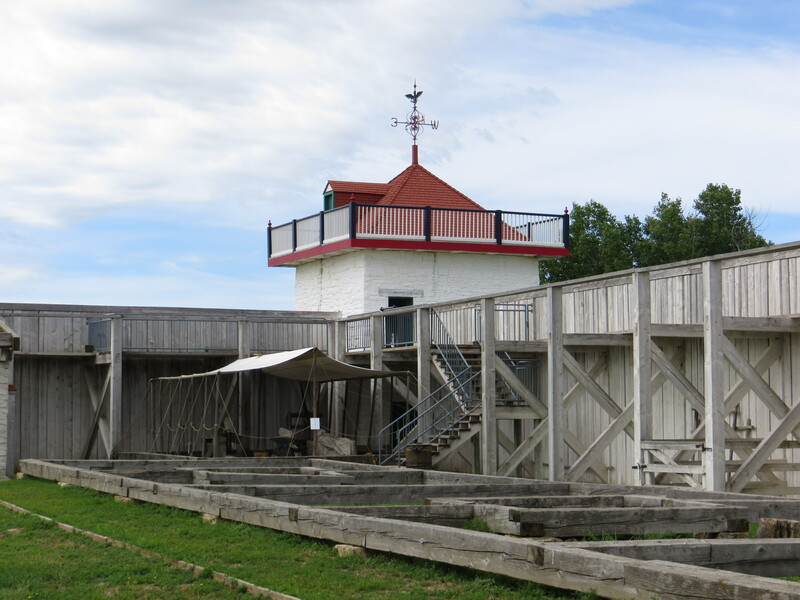 Also situated at this location is Fort Union. 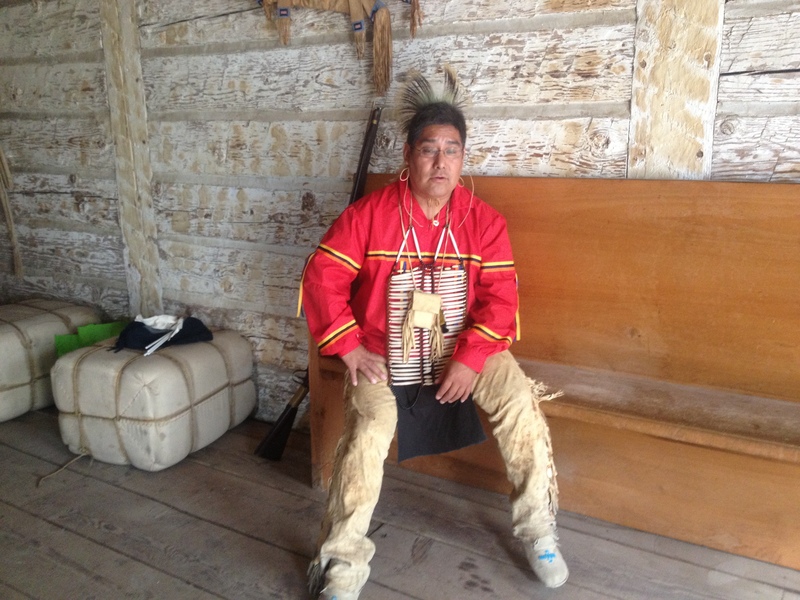 Norm Miller encouraged me to bushwack into the fort, which I did, and had the pleasure of meeting Yellow Bird, an Arikara Native American working at the Fort. I spent an hour or two visiting with him. 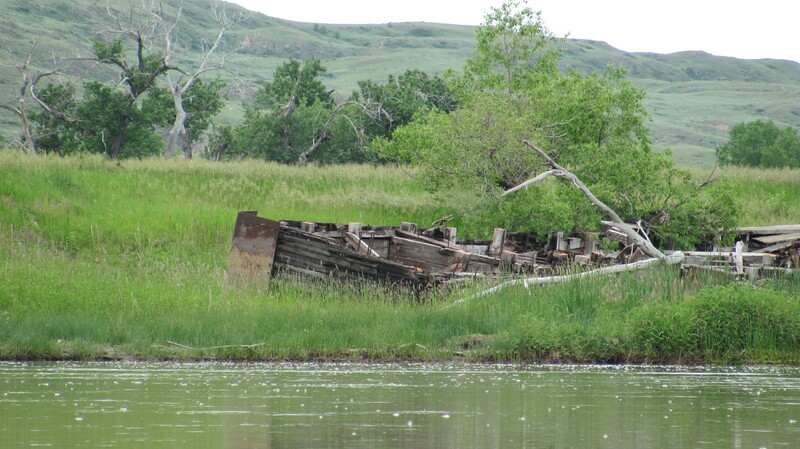 I enjoyed immersing myself in the history that surrounds this mighty Missouri River. Yellow Bird of the Arikara Tribe. 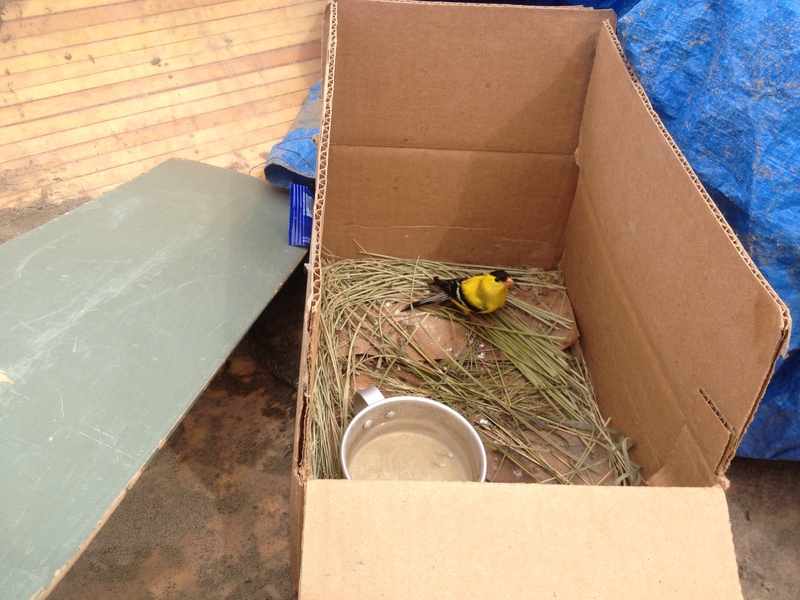 Yellow Bird holds two college degrees and is the father of five. Fort Union looking easily accessible. It is an illusion. You cannot see the muddy water-swamped mosquito-infested slog that you will encounter if you start walking toward the fort. Poor Shawn. He was not a happy camper. Norm had sent me aerial photos so I could find the easiest access to the Fort. 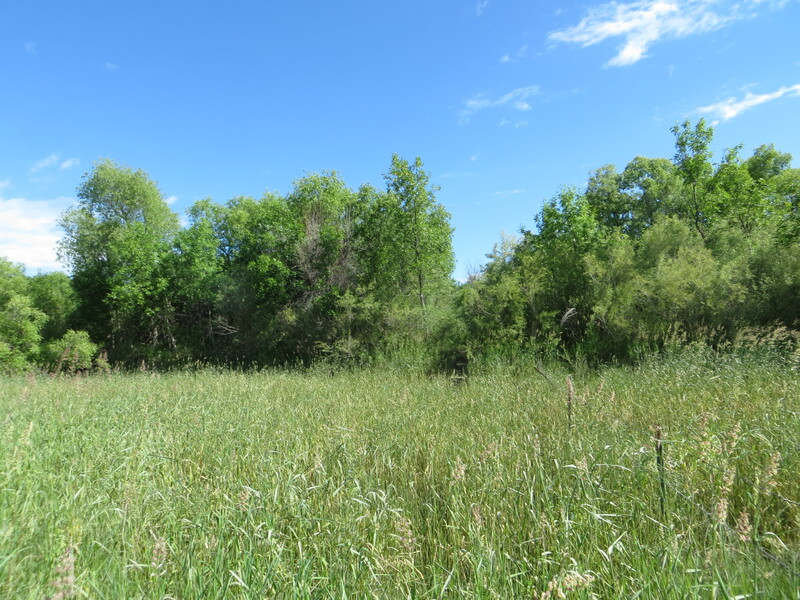 After two attempts, I followed the deer trail up to the outskirts of the Fort property. Some water but not bad with boots. This was 1/4 mile up river from the other photo. 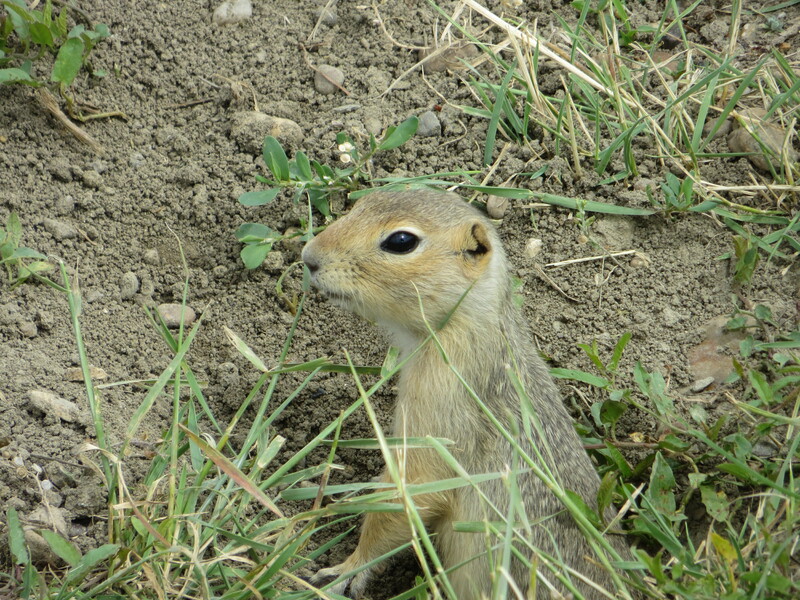 An underground resident enjoying the safety of a gated community. Watch out, or someone might get your hide! 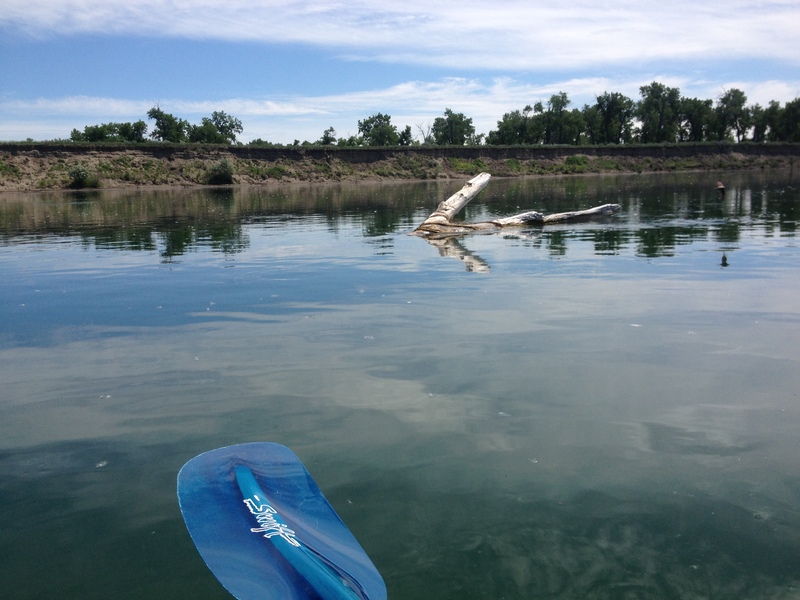 The confluence of the Yellowstone River is just a short paddle away. The staff at the Fort Buford Interpretive Center, located there, were kind enough to buy my camp site for me. I will continue my next blog post at the confluence. 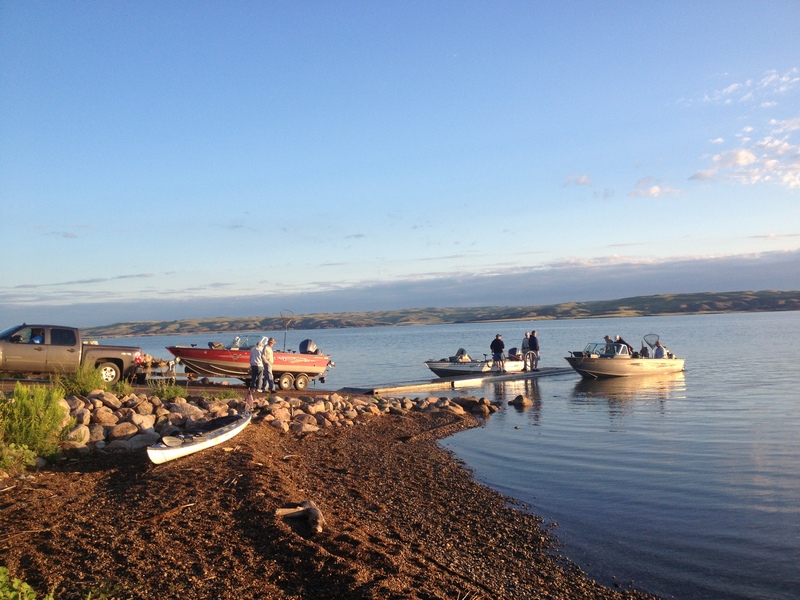 I will then be just a couple of days away from starting my trek across Lake Sakakawea. 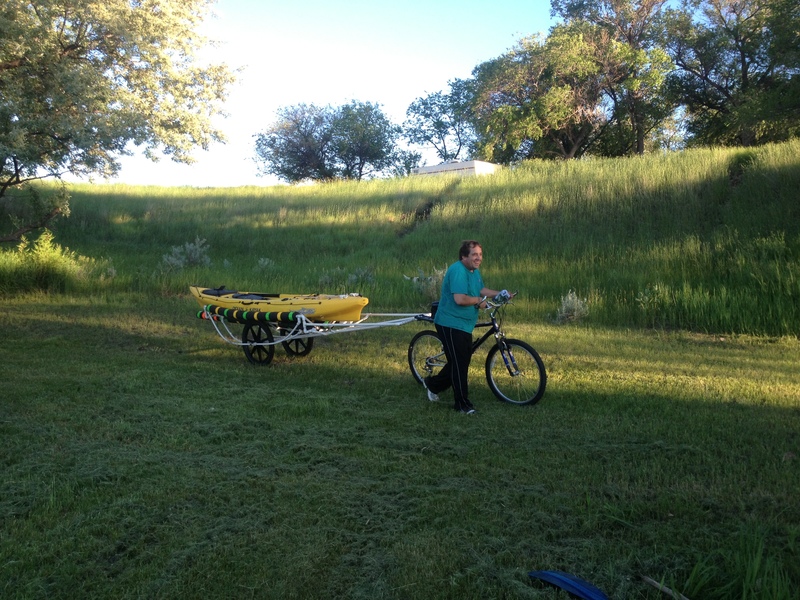 Shawn and I will meet up for the next few days, but then we begin our own journeys down the Mighty Missouri River. Sad parting with him, but not without a promise to reunite and share stories someday. Good-bye Montana. Hello North Dakota! I have been busy in post-expedition mode setting up my Mac Book Pro with all of my expedition photographs. I hope to utilize the iMovie and iPhoto programs to my advantage. Along the way I am stumbling upon some great stuff. This is one of my favorite interviews. Long time in the making, we finally connected. I had the pleasure of talking with Paul Schmid on September 20, 2013, while at home on a week-long break. I believe this is the most in depth, heart and soul, interview I have had. I was rested, content, and motivated to see this journey through to success. And, my mission was clear in my mind. For the three to five weeks prior to this interview, I had offered an apology to Paul on more than one occasion for missing an interview appointment. For example, in Omaha, upon arriving at the JP Dodge Marina, happy hour had begun and I was taken under the wing of a dock full of river angels. What a great sport Paul was, and all good in the end. This is an interview I am proud of. Warm thanks, Paul. Please click on the link below to listen to the podcast. The interview in its entirety is approximately 35 minutes. What a sweet moment of victory, seasoned with a dash of bittersweet. I had run out of river. A new chapter in my life was about to begin. I finally did it! I made it all the way to the Gulf if Mexico, but not without some very harrowing and tense moments in the Southern Louisiana fog. Fog? Who knew? That was an oversight on my part. Forgot about the fog. 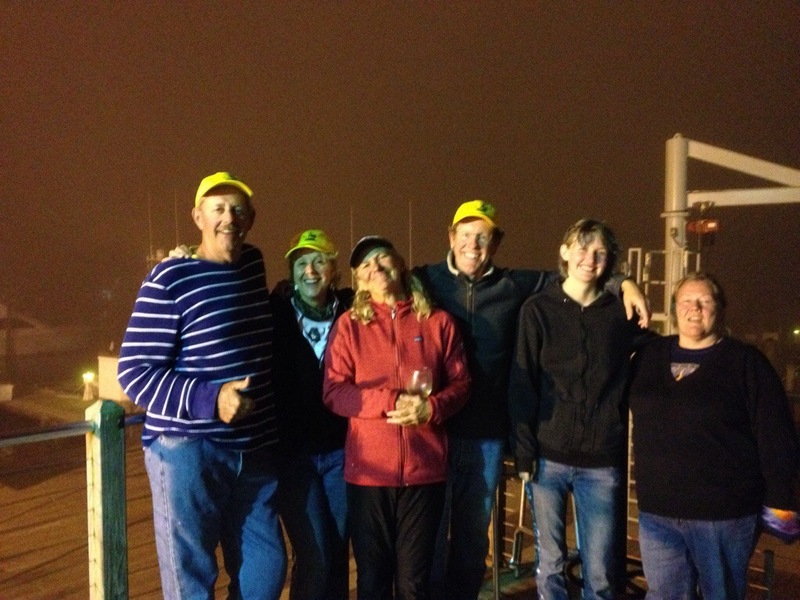 This is my amazing support crew that helped get me through the fog, through the Head of Passes, down South Pass to the Gulf, and back to Venice in a thick fog bank. What an epic finish to an unforgettable journey. Big THANKS to my support crew, the Bar Pilots and their crews in Venice and Pilottown, and to all of my supporters who cheered me on every single day! 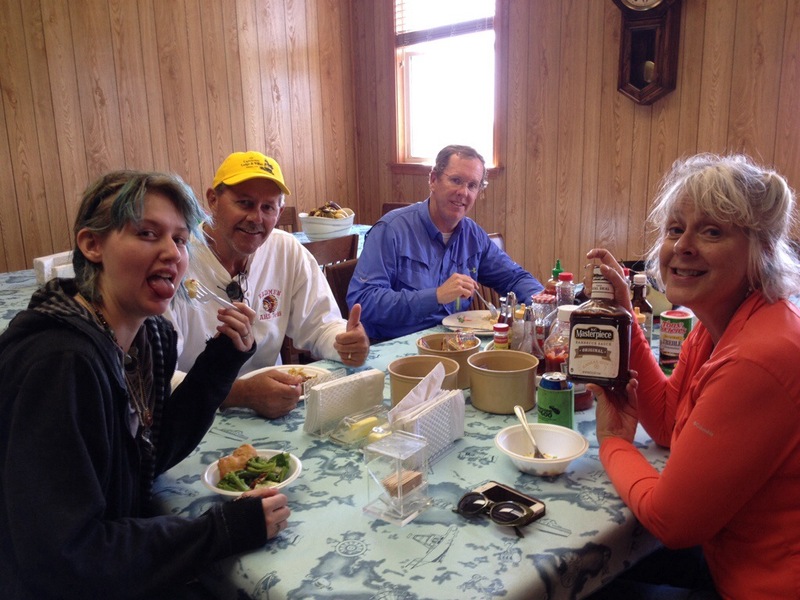 L-R: Mark Dierking, Denise Goforth, Mwah, Jamie Stevenson, Haley Moreland (my sweet daughter), and Deb Miller. Extraordinary!! Pilottown Crew to the rescue! 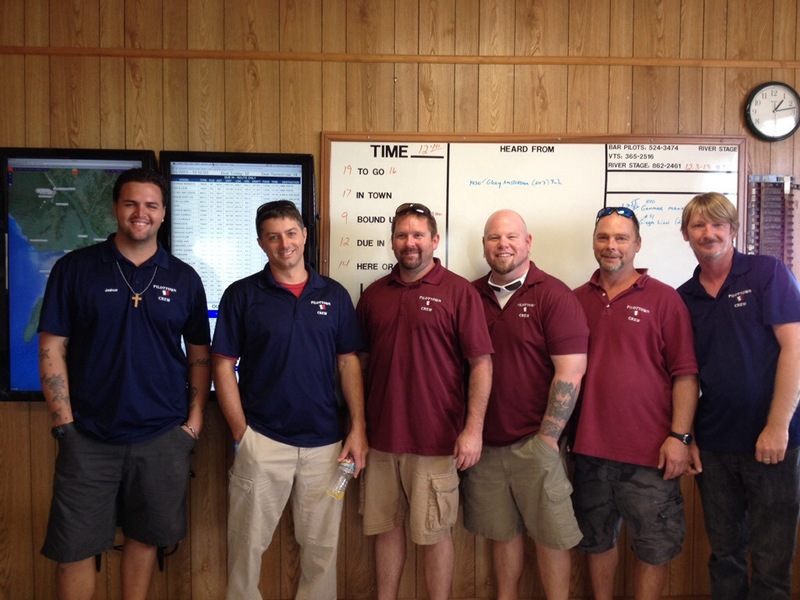 L-R: Josh, Eric, Adam, Booher, Leon and Shawn. 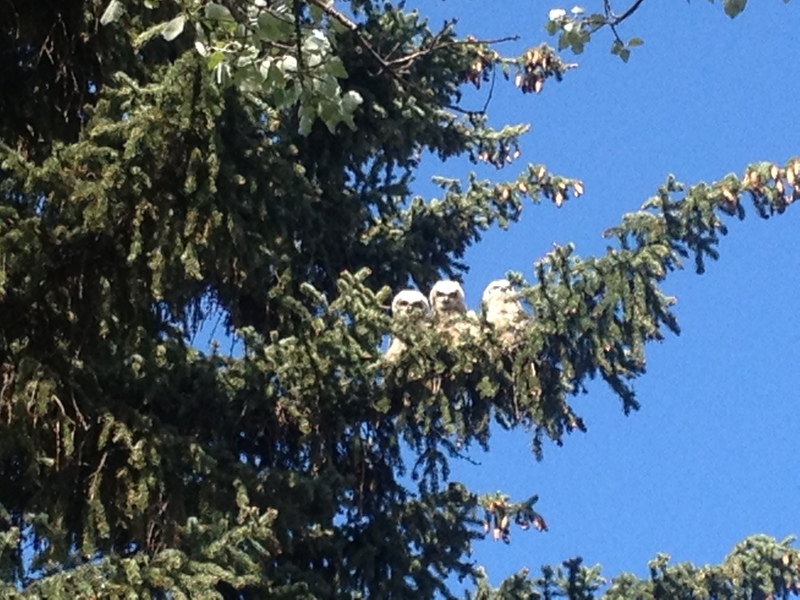 What a comfort these guys were after being in a very uncomfortable fog. Thank you, gentlemen! You are the best! 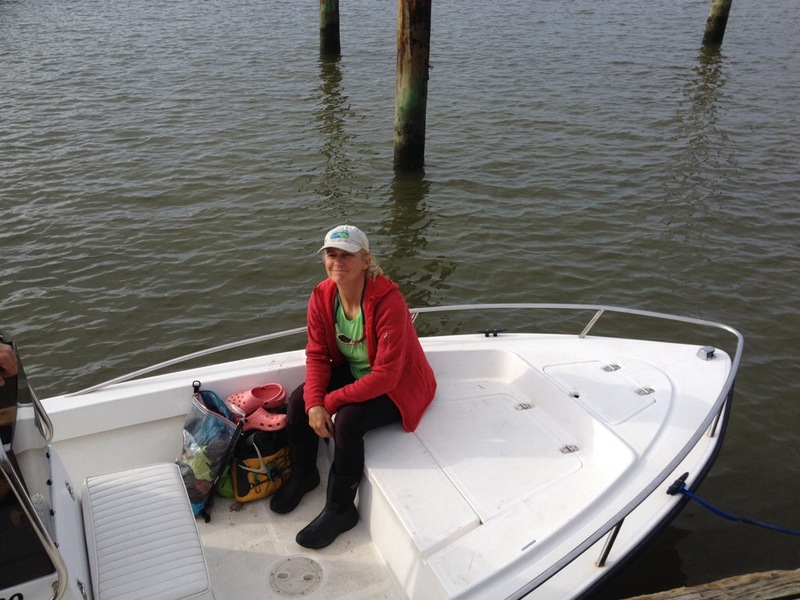 Our first attempt to make it to the Gulf was on December 4. 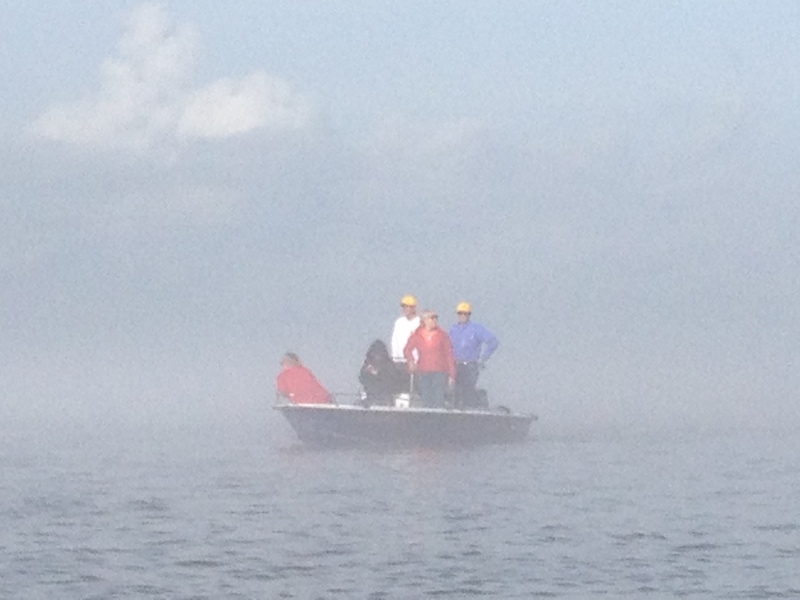 We were doing pretty good on the East shore, although the fog was lingering on that side. 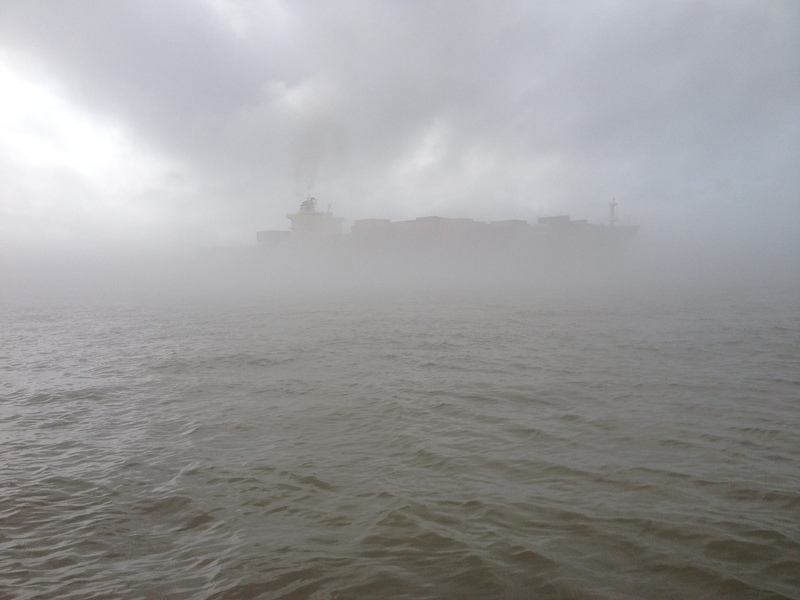 By the time we passed Pilottown in the fog, we were engulfed. At one point we all heard a boat coming right toward us. I was out of the channel, and so was my support boat, but I didn’t know it. They were in only three feet of water. Hearing the boat coming closer and closer, but not seeing it, I was terrified they would be run down by a big fishing boat. I screamed at them to turn around. They appeared to be frozen staring into the fog. Oh. My. God. Will I witness their demise???? Thankfully, no. After the boat passed us by, we all knew we were finished for now. I got on the phone to Pilottown and asked them if we could come ashore. “Of course, we will be expecting you,” they replied. 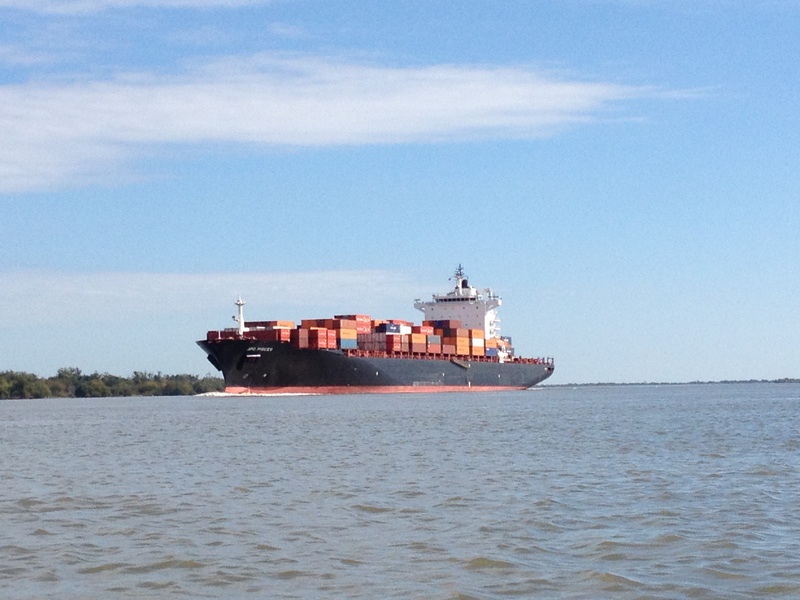 When we arrived 15 minutes later, they immediately took us under their wing, brought us inside, fed us from a smorgasborg outlay of food, shared their ‘mission control,’ and educated us on their system for bringing big ships up from the Gulf to New Orleans. 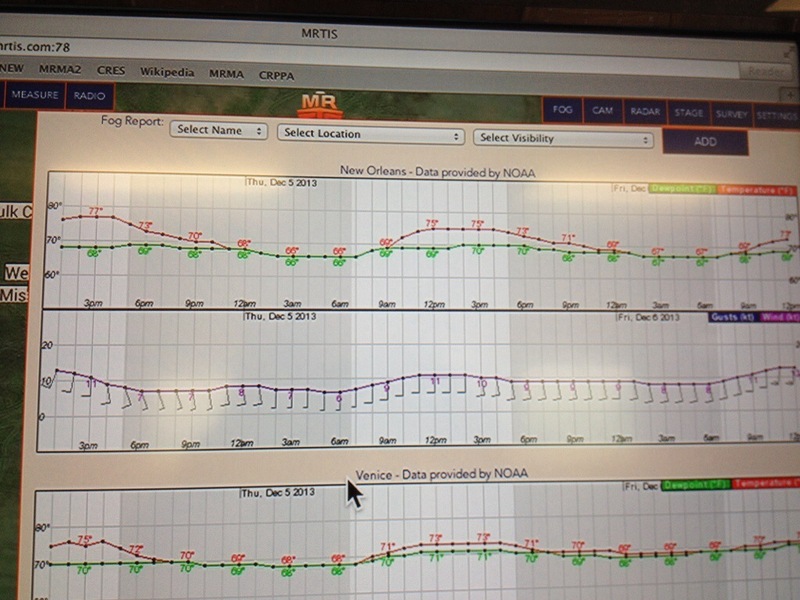 Most importantly, they explained the Fog Predictor, which indicated a lift in the fog at 9:00AM until midnight tomorrow, December 5. We set our goal to the Gulf for tomorrow. They invited to breakfast, too. So nice and comforting, these river angels. The Pilottown crew directed us to the back room where we feasted. From sadness to gladness, comfort on many levels. The fog predictor. The gap in the red and green lines on the top indicates our window to shoot the pass and get back home. I tell ya, adventure in its purest form. A tiny portion of the breakfast offered to us by the Pilottown crew. 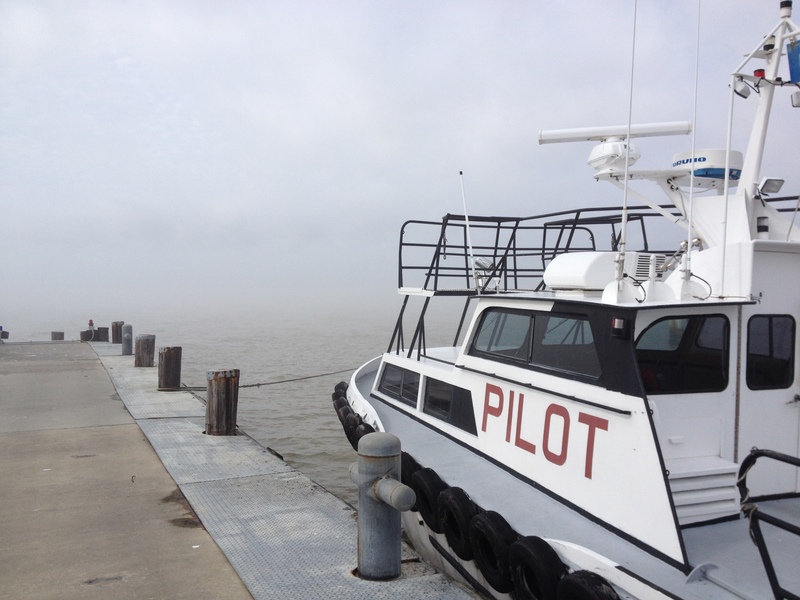 The fog was thick the 10 miles from Venice to Pilottown, which is located one mile above Mile Zero. 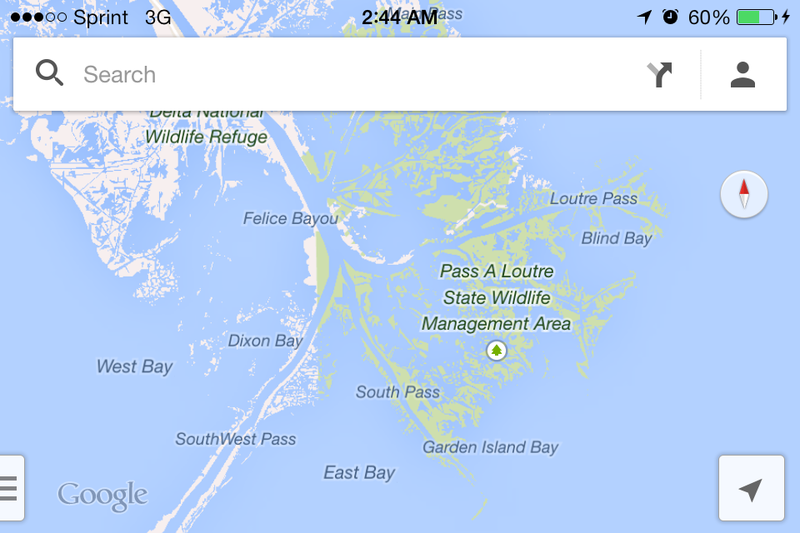 The Gulf of Mexico is 12 miles from Mile Zero down South Pass. South Pass is the route I had chosen to reach the Gulf. 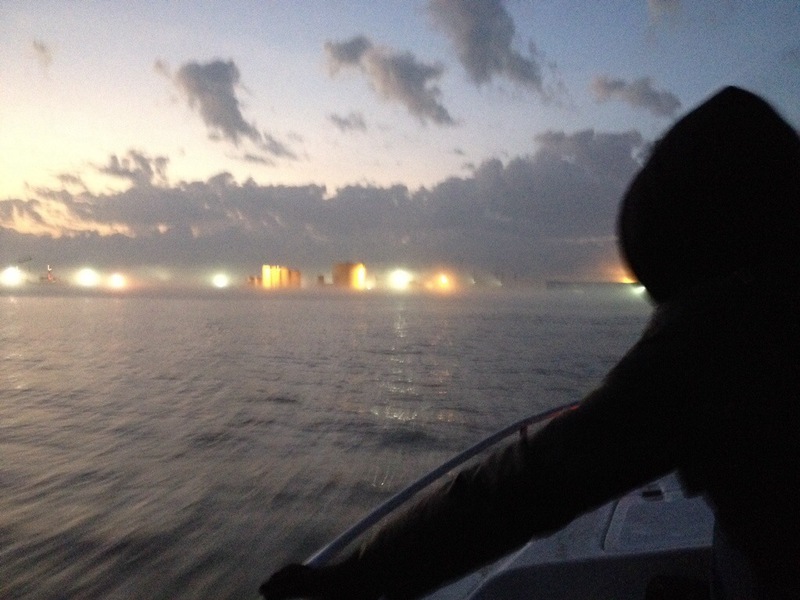 On the final dash to the Gulf, my greatest concern was the fog in the Head of Passes. This is a wide open space from which three branches of channelized water run to the Gulf. 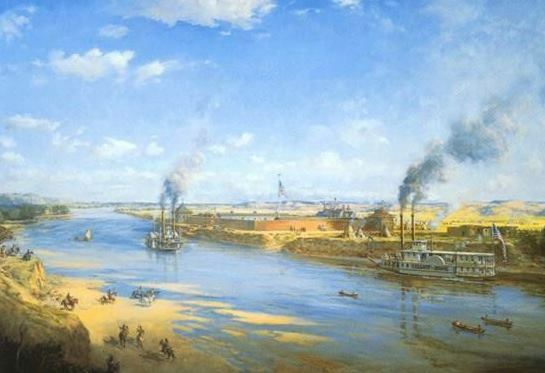 The Southwest Pass is the shipping lane for tankers, freighters, and container ships, Loutre Pass is mainly small craft and fishing boats, and South Pass fishing craft. Tankers come up SW Pass and cross through the Head of Passes to the West Bank near Pilottown. 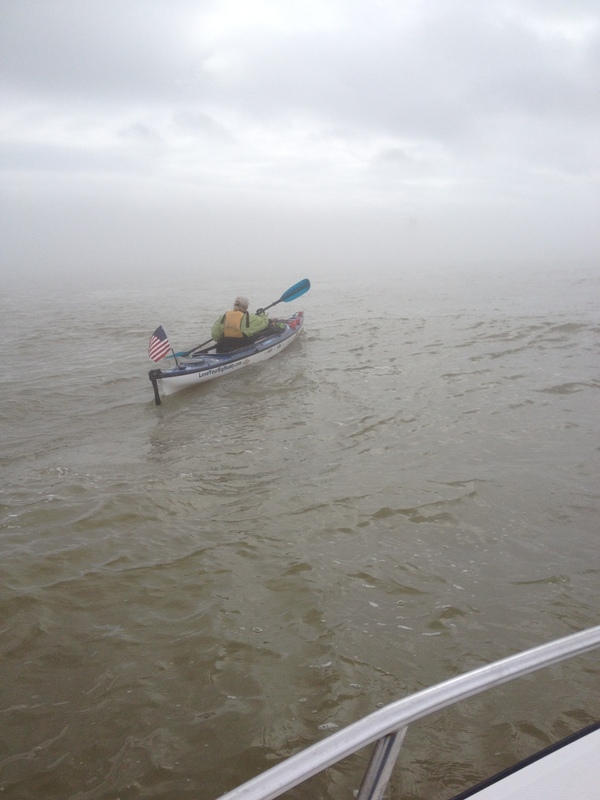 As you can imagine, in the fog, this is a dangerous route through which to paddle. 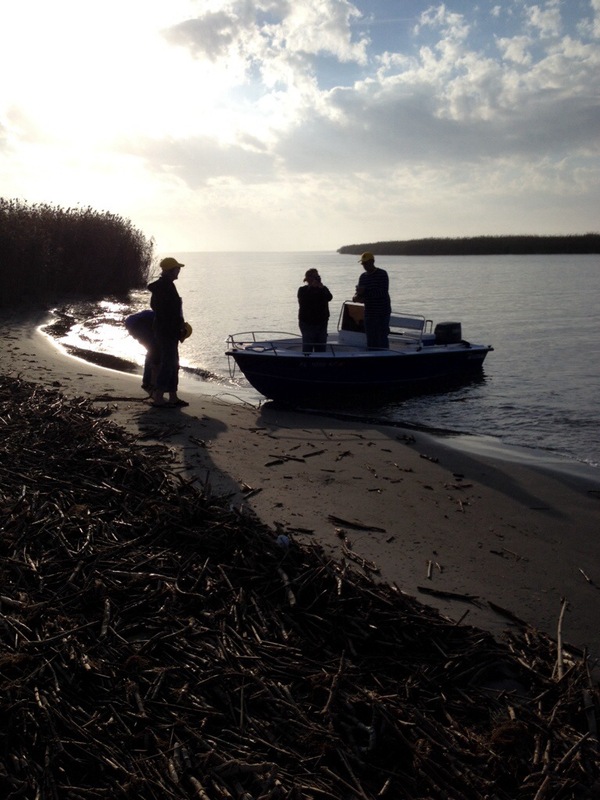 Just prior to leaving Pilottown, three Plaquemines Parish Marine Sheriffs pull up in their boat on their way down to Port Eads, located one mile upriver from the Gulf down South Pass. When I found this out, I somewhat pleaded with them to guide us through the fog through the Head of Passes with their radar. As you can see in this photo, I was gravely concerned. I could not get them to commit, for whatever reason, so we determined to just go for it with the support we had from the Pilottown crew, and the Venice pilots, who drive the ships up the Pass. I asked them if they would guide us through the Head of Passes with their radar. They could not commit. We had to go ahead on our own. Off we went with great apprehension coupled with extraordinary determination. I took this photo the day before. But, you get the picture. Tense moments to say the least. The Pilottown crew were phenomenal in communicating our whereabouts to the best of their ability. However, when they began asking the ship pilots if they had seen us, I knew we were on our own, so to speak. We had to navigate wisely through this stretch or catastrophe would be imminent. What we did know from my marine radio, was when a ship was coming up through the fog out of SW Pass, or down into the Head of Passes past Pilottown. 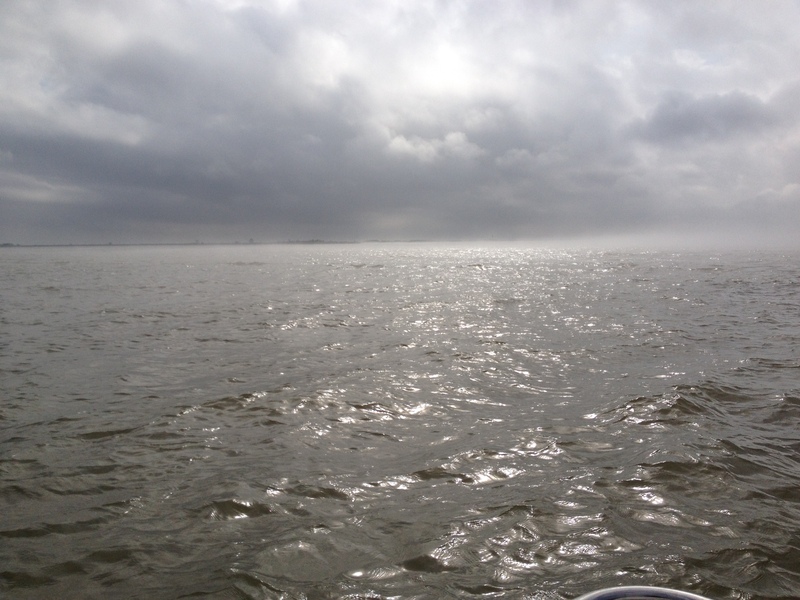 Mark used his depth finder to try and avoid the channel, but at some point we had to cross. 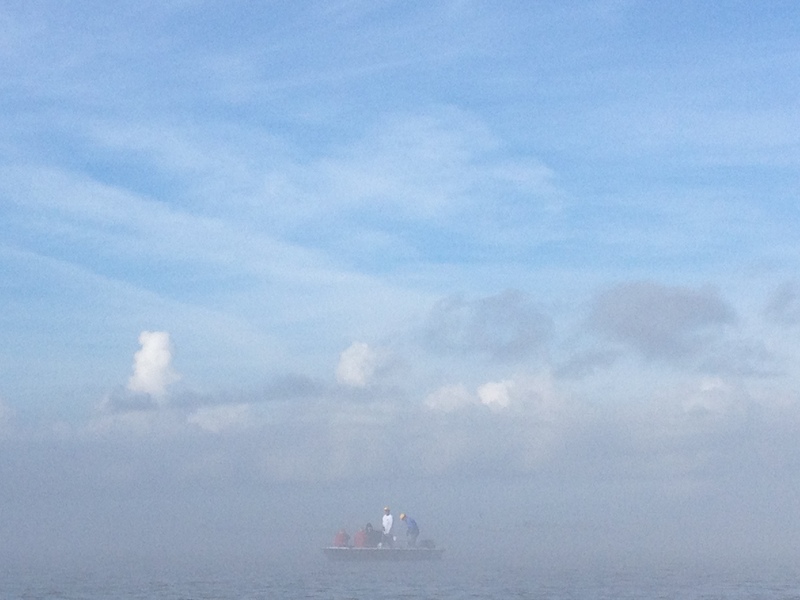 Ship coming into view through the fog. There was a moment when we were immersed in fog and very vulnerable. 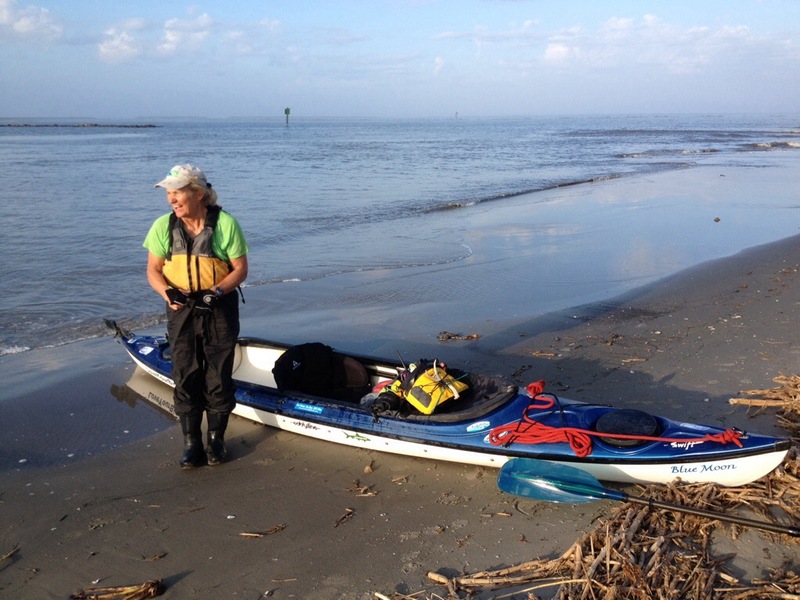 I began to paddle with my GPS as my guide, which is what the crew told us to do. How scary is that in the fog???? Very! As my heart began to sink further into my gut, I mustered everything I had to keep my composure, as we all were doing at that time. At that very moment, we heard a boat coming right for us. Oh my God! Will it see us in time to stop??? All we can do is wait as it gets closer. Then, appearing as though angels from the spiritual realm, the Sheriff’s boat appears and immediately they begin pointing out the channel light at South Pass. 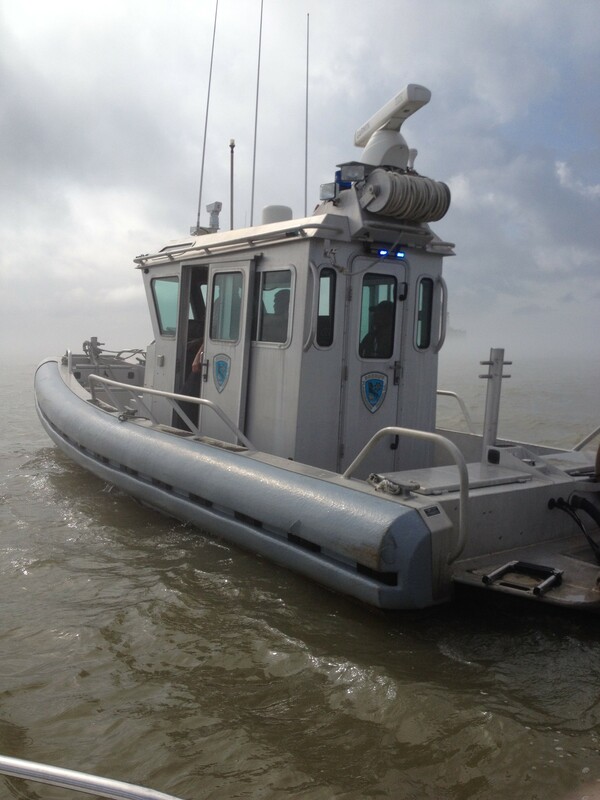 Marine Sheriffs of Plaquemines Parish. I couldn’t believe my eyes. Miraculously, the fog began lifting at that moment and we could then see all three passes! What a moment of joy and relief that was, never to be forgotten. Extreme JOY! I can see all of the Passes! I paddled harder than I had paddled on the entire journey, the 12-13 miles down South Pass. I took out my iPod and played river songs and sang at the top of my lungs, particularly Black Water by the Doobie Brothers. Playing music always gives me a much-needed boost of energy. 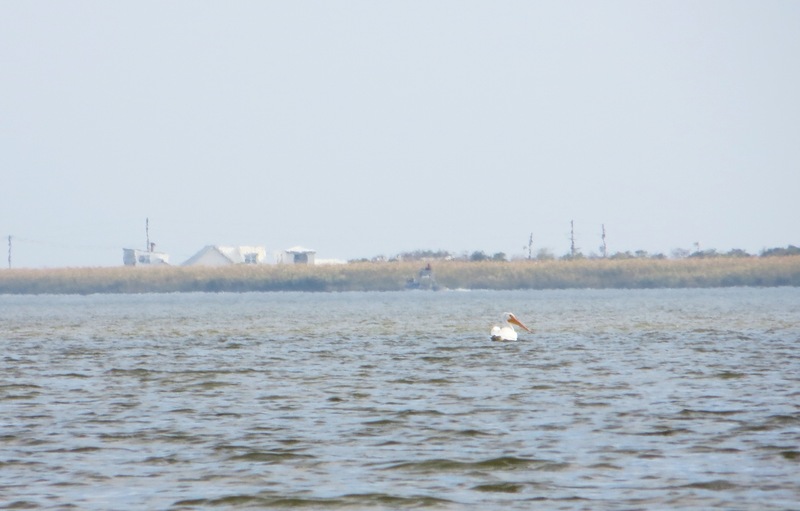 The highlight of my entire trip had to be when I saw my white pelican near the shore in South Pass. I couldn’t believe my eyes! 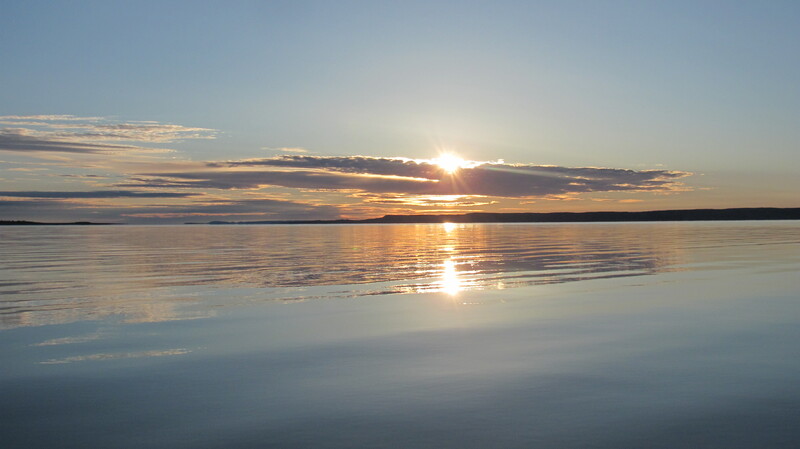 He had come to see me through to the end, and provided that quiet comfort we both understood, that he had provided since day one of my paddling journey. I still shed a tear when I think about how perfect and complete this trip has been. The perfect good bye and congratulations. 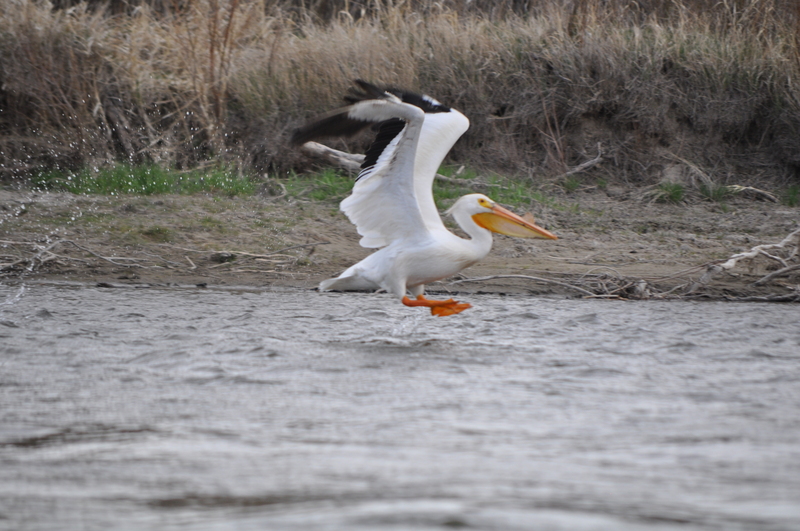 I was immersed in joy and supercharged with energy after seeing my pelican friend. We had a clear shot to the Gulf, and most of the way back up the pass. We were not out of the woods yet. 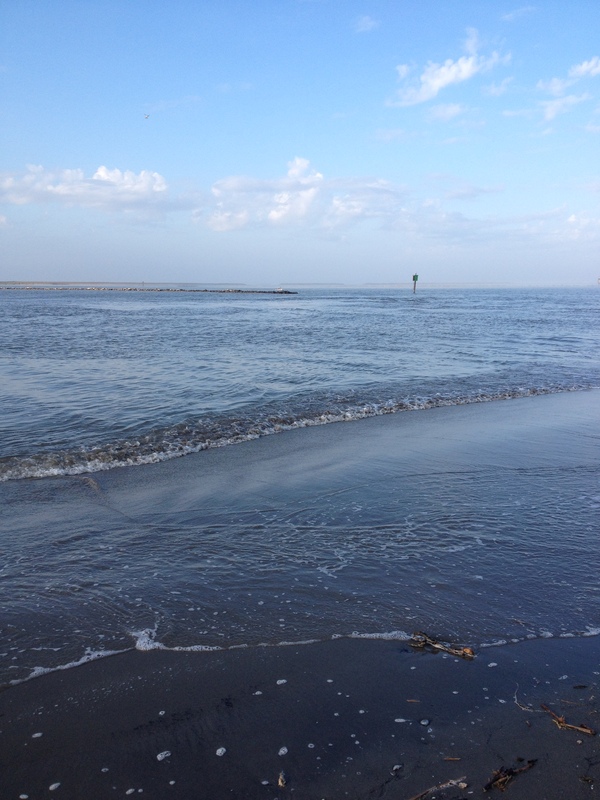 But we had made it to the Gulf of Mexico! take some photos of my arrival. What a sweet moment of victory, seasoned with a dash of bittersweet. I had run out of river. A new chapter in my life was about to begin. I was thrilled. We made it about 2/3 the way up South Pass when the fog settled in again. We were on a race against time and fog. We absolutely HAD to get back to Venice before dark. We moved as one with eyes and minds on high alert. As you can imagine, the victory was oh so sweet. We made it back to Venice safe and sound, just in the nick of time. It was dark when we pulled up to the dock. 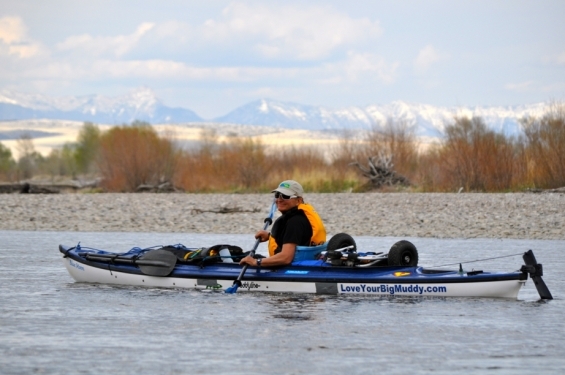 My faithful horse, Blue Moon, an Eddyline Shasta Kayak. What a sweet ride and loyal companion. I love my boat. 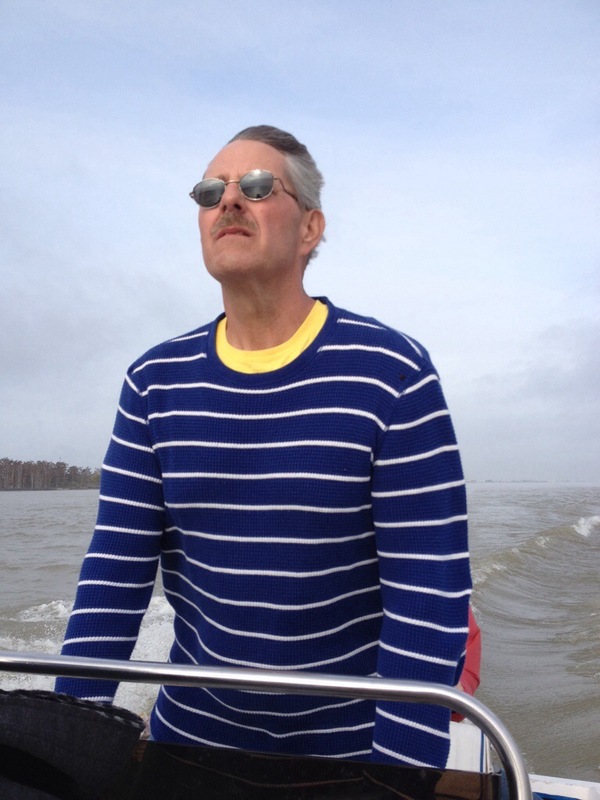 Thank you, Mark Dierking, for a stellar job piloting the support boat and keeping us all safe and alive. You are the best! Jamie Stevenson, Denise’s boyfriend, was the premium first mate and pillar of strength throughout. LoL! No, really, he was. We all were. We were bonded and quite frankly, family, after these few days together. What an unforgettable experience! 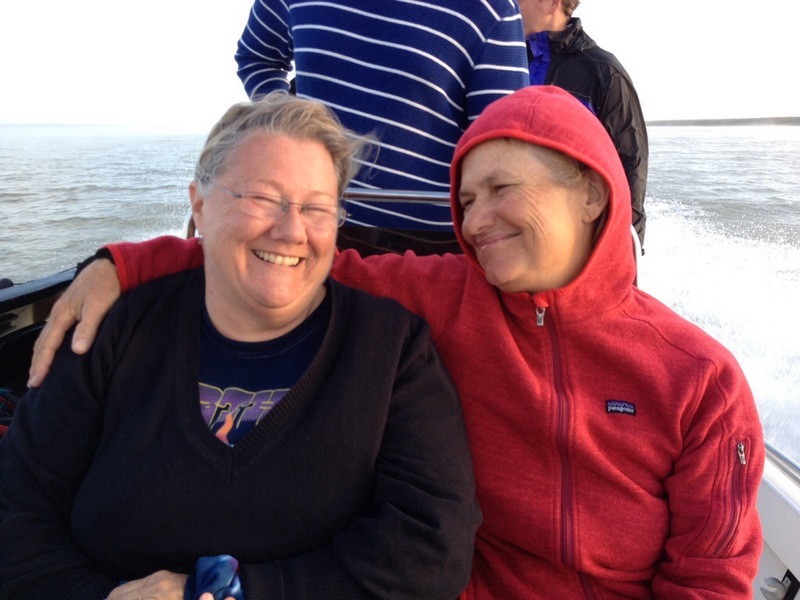 Deb, one of my dearest and closest friends. Wow, what a ride, eh girlfriend?! We did it! Our home away from home in Venice, Louisiana. The Lighthouse Lodge and Villas comped our villa for all but one night, the night that April donated to the expedition. Big thanks to April Durnin for donating to the expedition two free nights of lodging (one night for two rooms) at this fabulous hotel. We could not think of one single complaint. The villa was extraordinarily lovely. 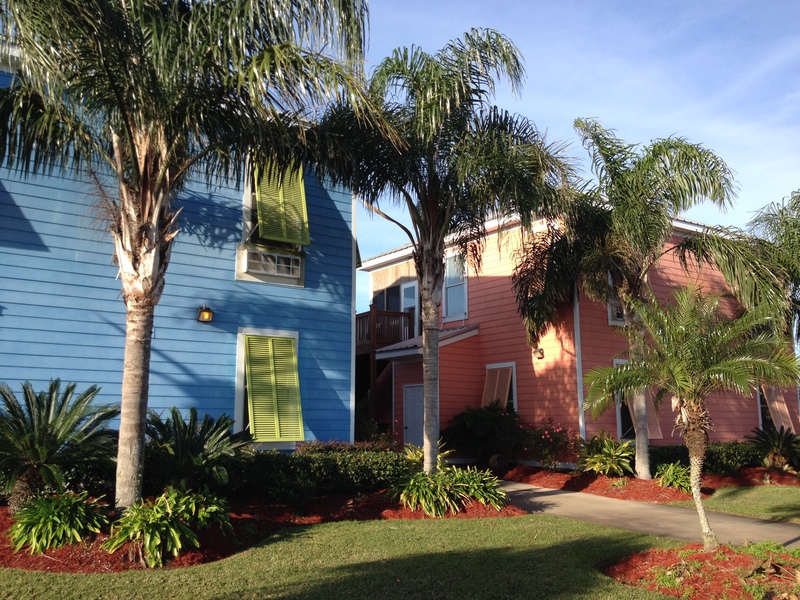 The Lighthouse Lodge and Villas in Venice, LA. We give the villas five bright and golden stars. Loved it! I will be updating this blog in the days to come. That will help me sort through my photos and videos, and reminisce on the pleasures of this incredible journey. Then, of course, I will write a book, or books. 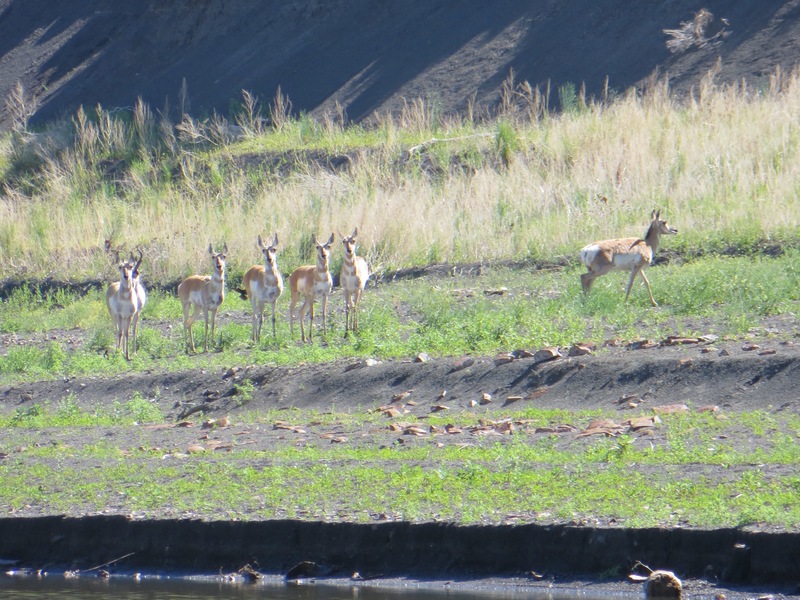 I would like to write a memoir, a curriculum book with lesson plans and activities focused on the rivers and natural environment, and a coffee table book with some of my best photographs. Oh, and T-shirts. I want t-shirts made ASAP. Maybe a calendar right away. So much to do! I will follow up this post with some videos as soon as possible. Until then, I hope you enjoyed the adventure of my final days. I’ll be back to fill in the gap. 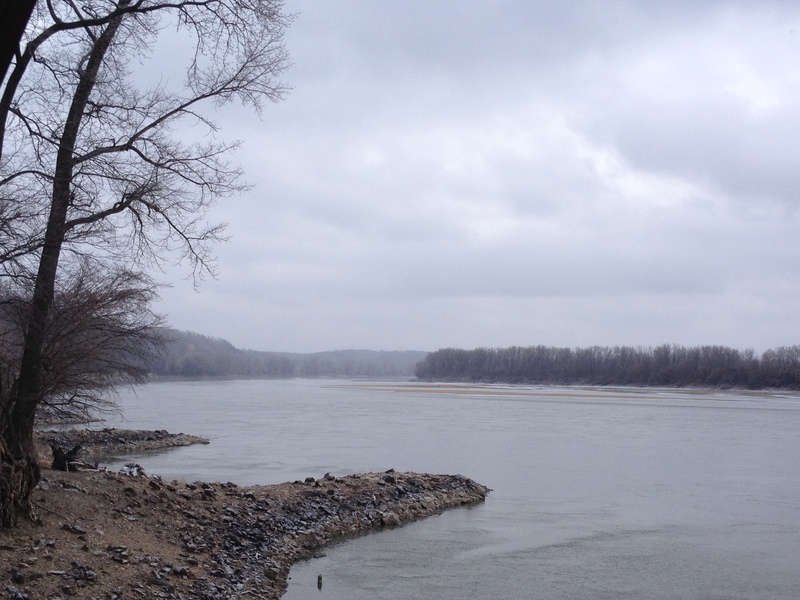 The Missouri/Mississippi River System is the Fourth Longest in the World.